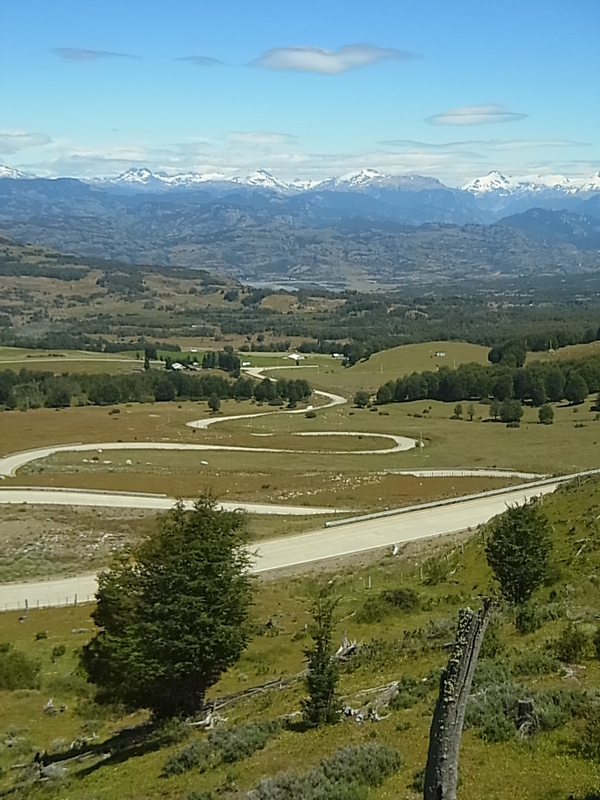 Itˋs not only the natural beauty – there are many beautiful and easier accessible places to cycle – but for us itˋs the combination of everchanging nature, remoteness and sporty challenge what makes the Carretera unique for cyclists. 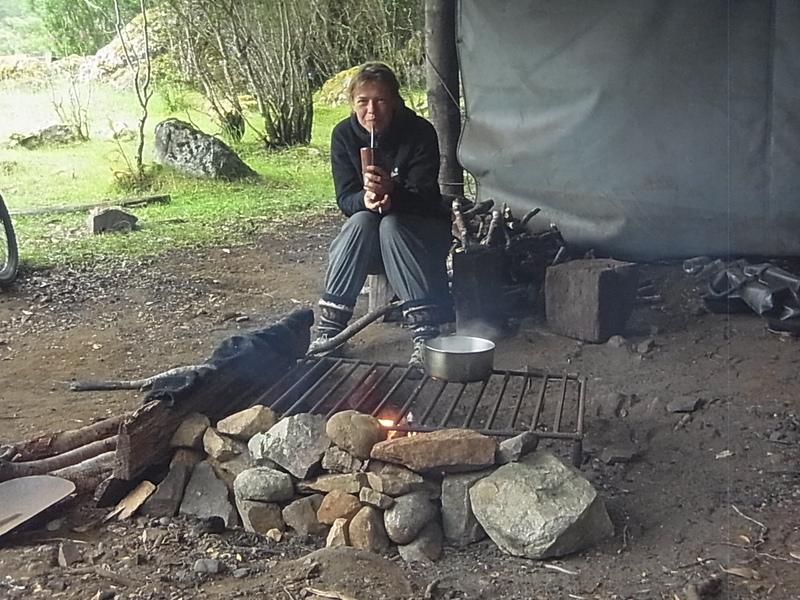 Even with our “velocity” there are new views and sights behind every corner and hill, fresh drinking water every few kilometers, plenty of beautiful campsites close to streaming water and always with the opportunity to make a bonfire for cooking – what a luxury to be supplied with all the basics one needs. 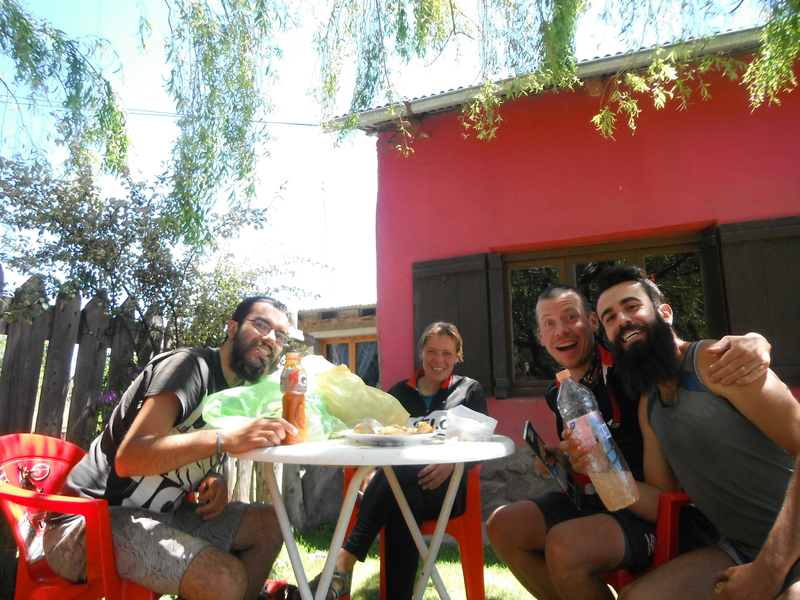 700 cycled kilometers, 300 more to go – we enjoy every single day and slow down even more to savour the remaining stretch of the Carretera. 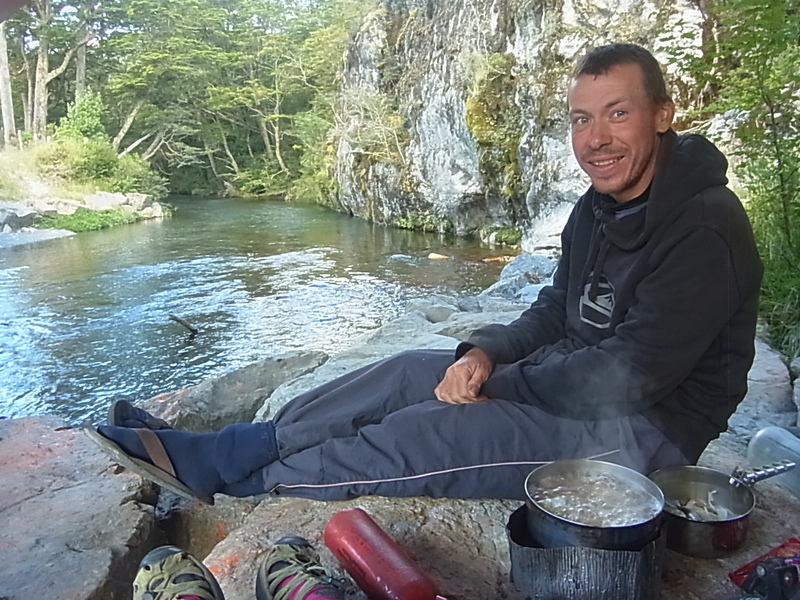 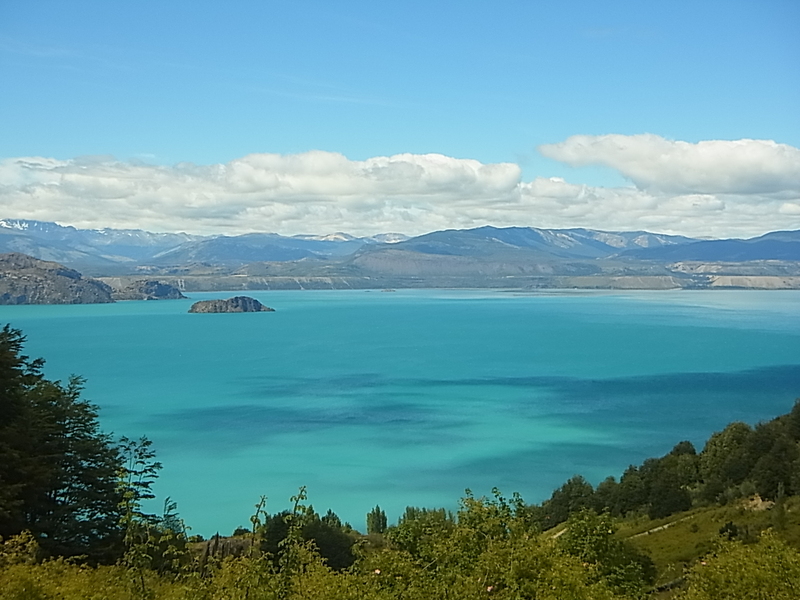 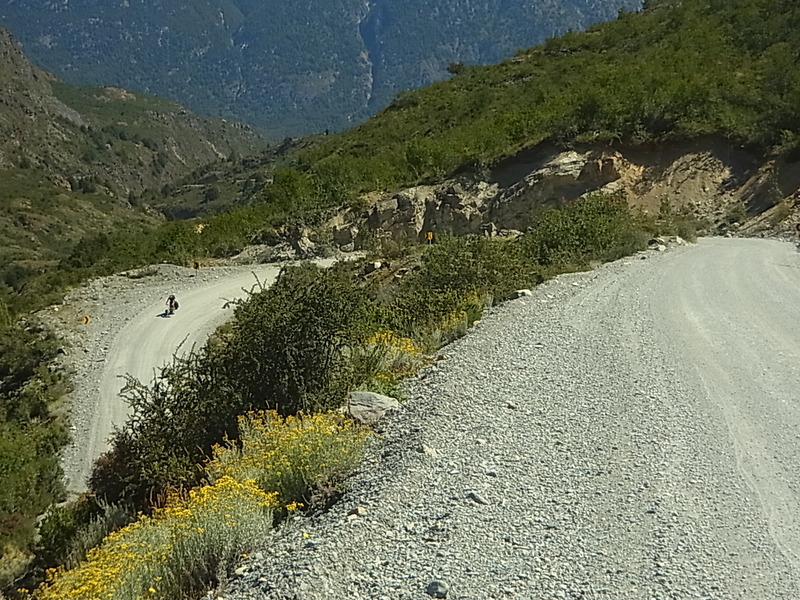 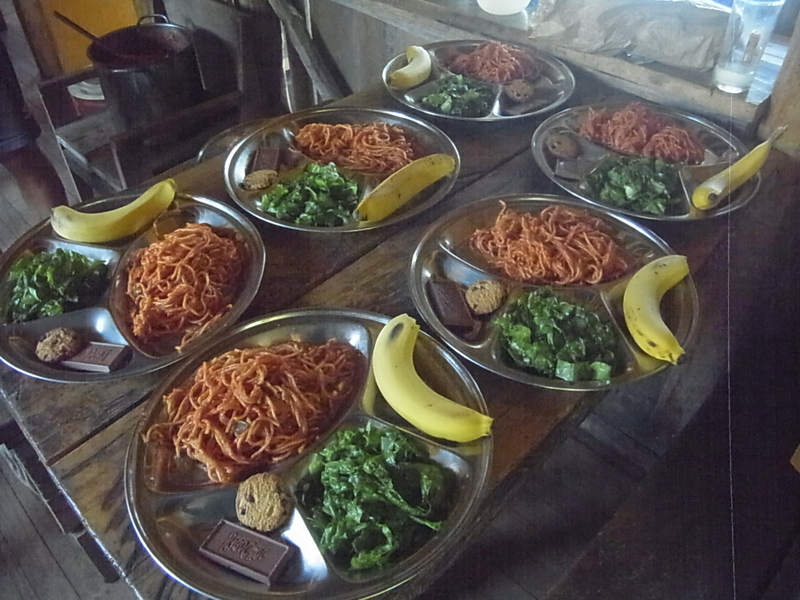 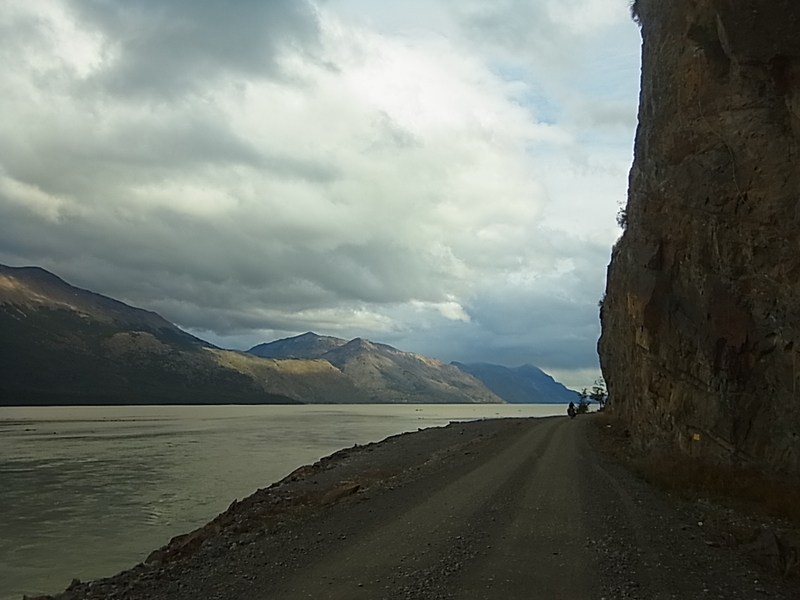 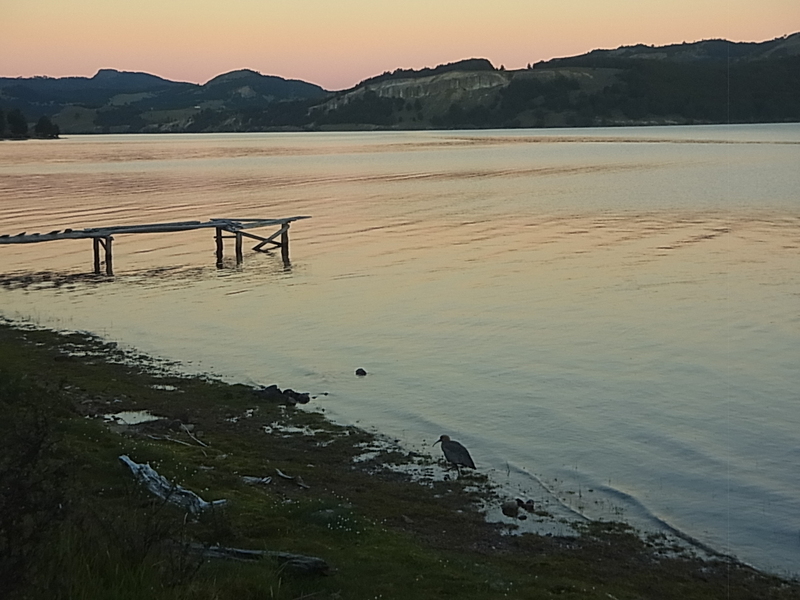 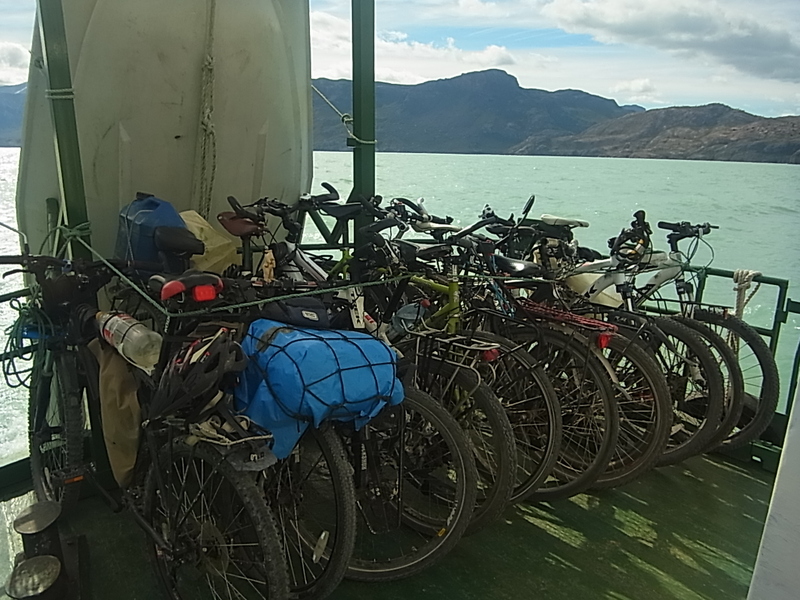 There are some more encounters with known and (yet) unknown cyclists, we stock up around 12kg of food for the last 200km (or five days) in Cochrane and finally reach Puerto Yungay at the Fjord Mitchell where we have to take the ferry to cross it. 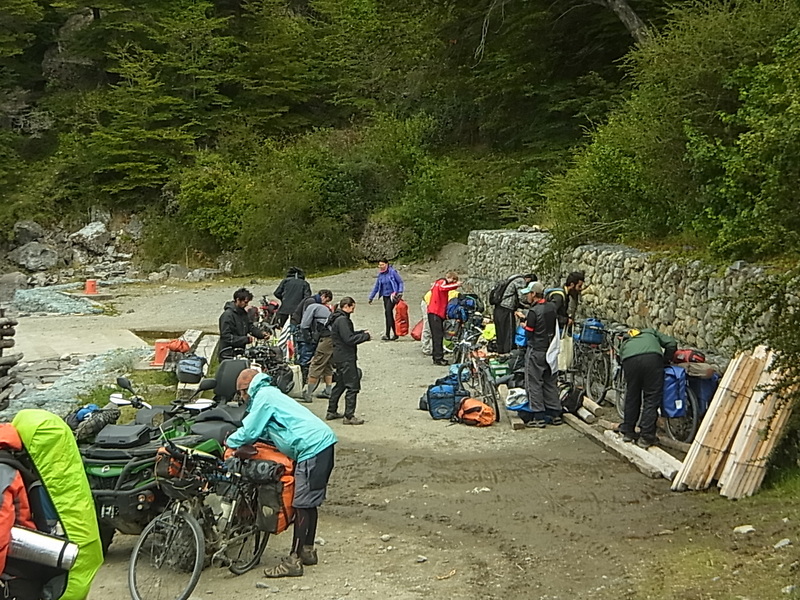 Six hours waiting time, then the one-hour-trip starts with more cyclists on board than cars. 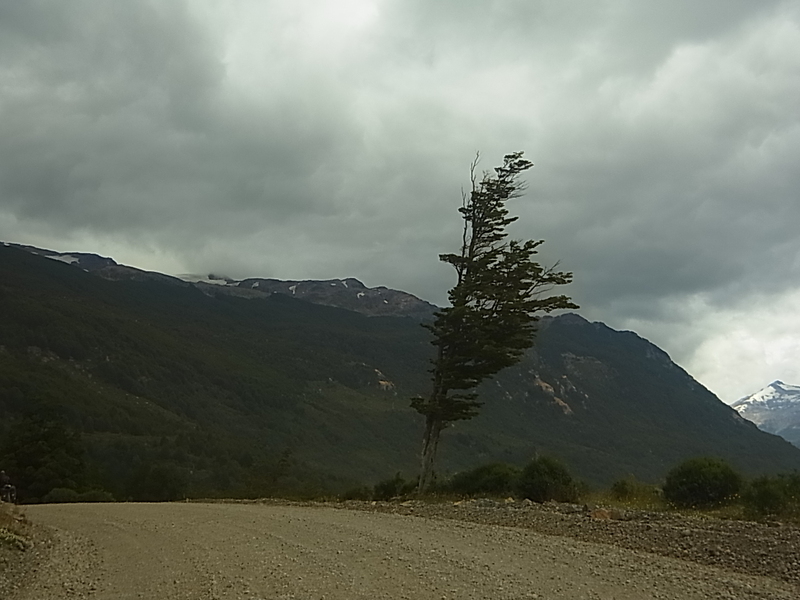 Then itˋs on to the last 100km and we get a little bit melancholic. 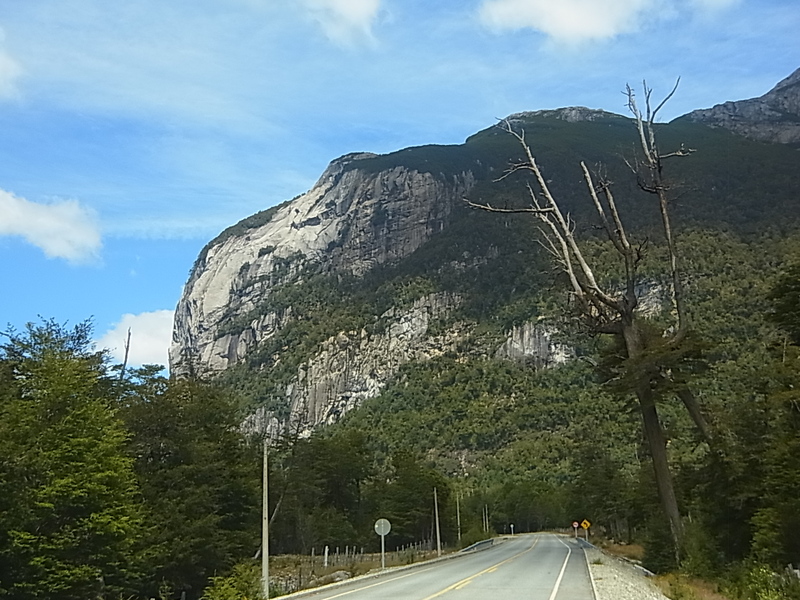 For sure the world doesnˋt end with the Carretera. 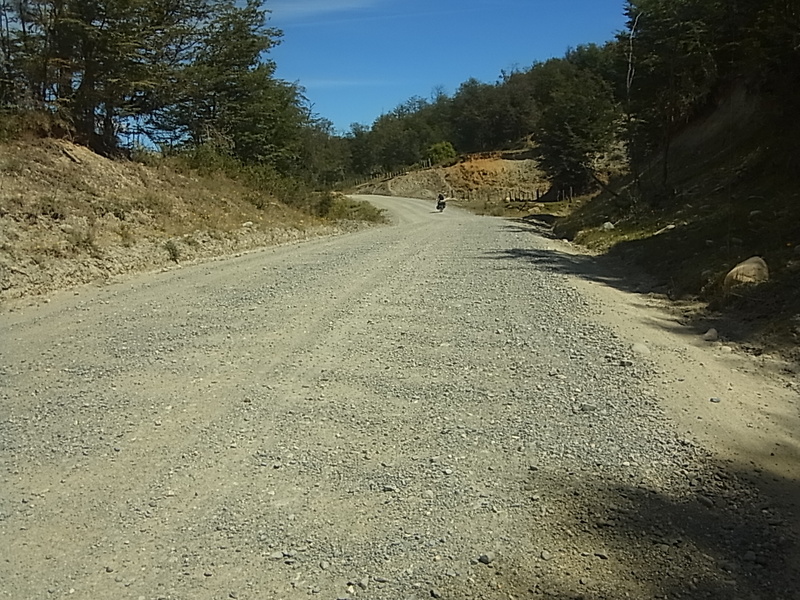 And for sure there will be more great cycling in the future. 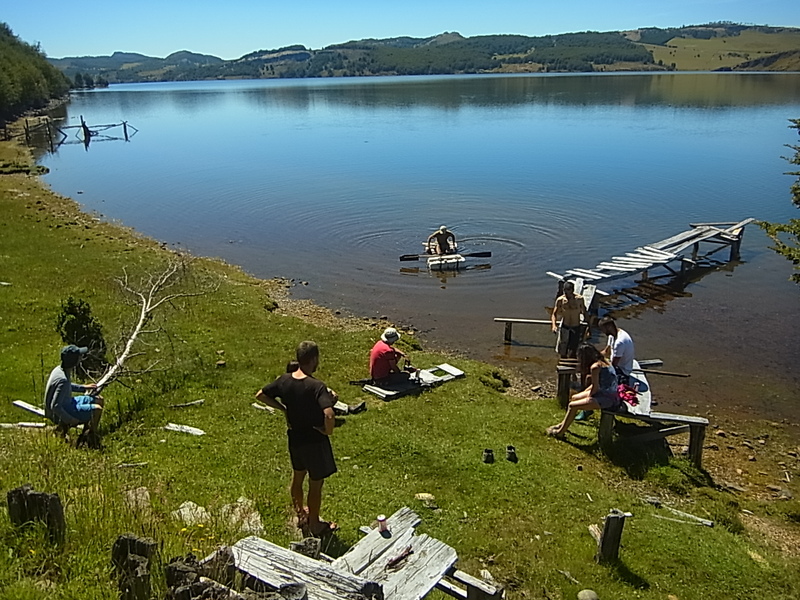 But still, this time here was special and we are a little bit sad coming close to an interim end. 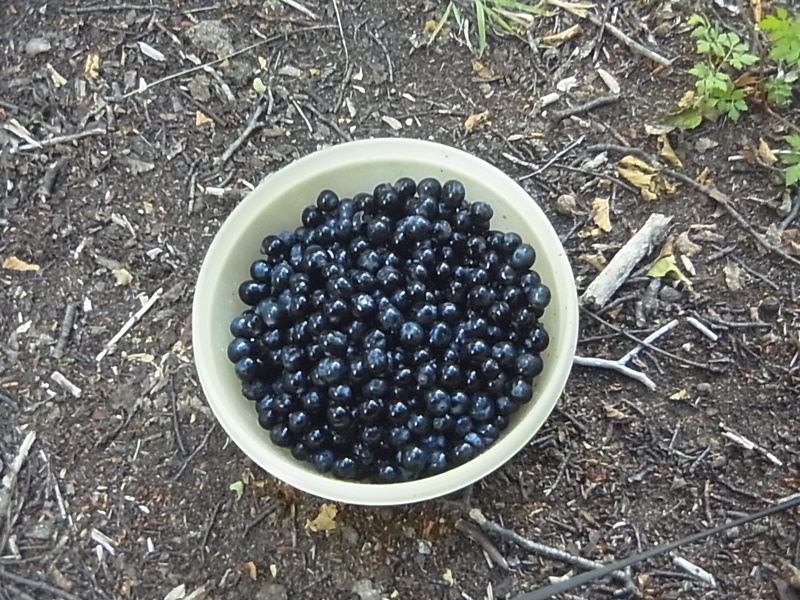 Following a local saying, one has to eat Calafate-berries to make sure that one comes back to Patagonia someday and so we pick the berries whenever we see them whatˋs quite often. 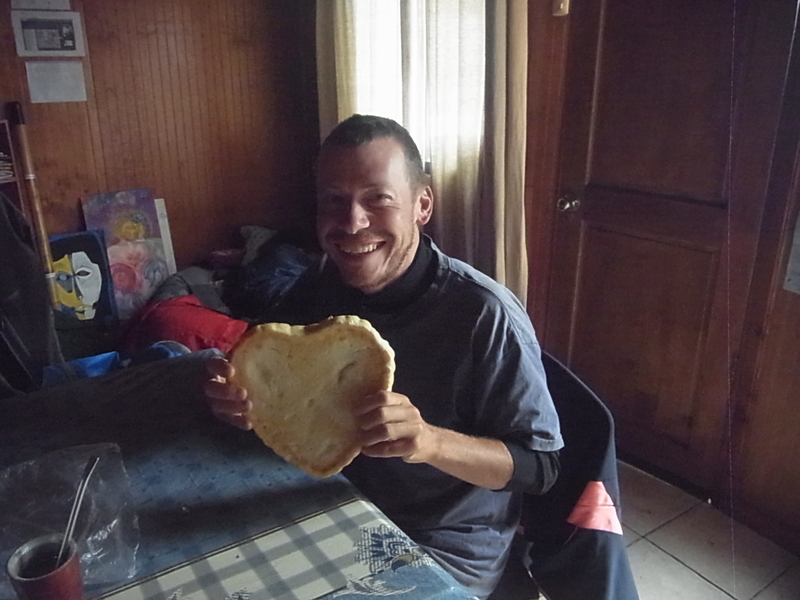 They are really delicious, mashed with sugar on bread or mixed into porridge, and besides the saying they are a good source of vitamins in our fruitless diet. 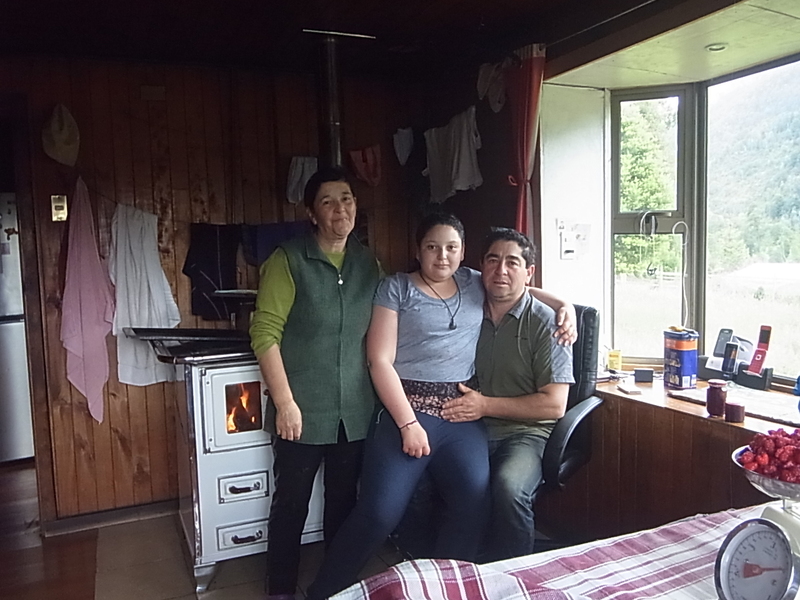 Fruits and vegetables are of poor quality and more than expensive down here – the price for everything that has to be brought in over hundreds of kilometers. 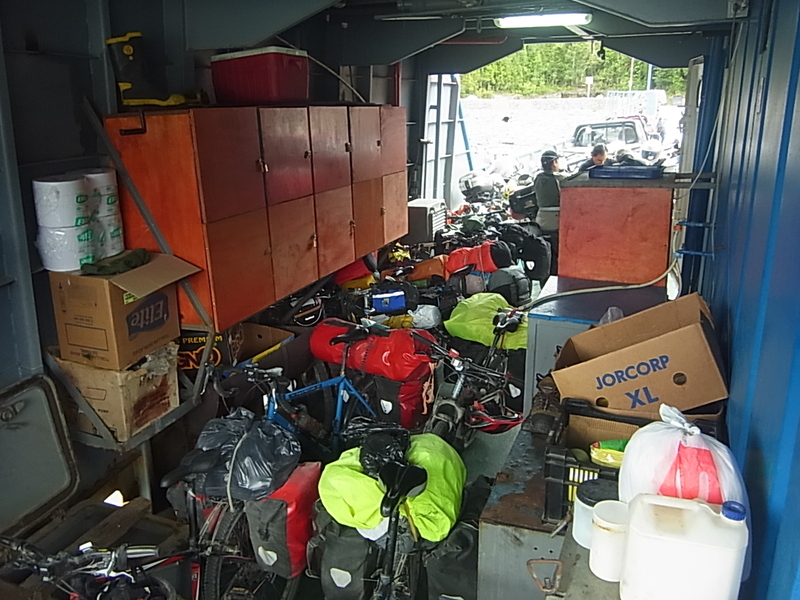 The local people know the delivery days (usually once every two weeks) and within an hour the delivered goods are sold out. 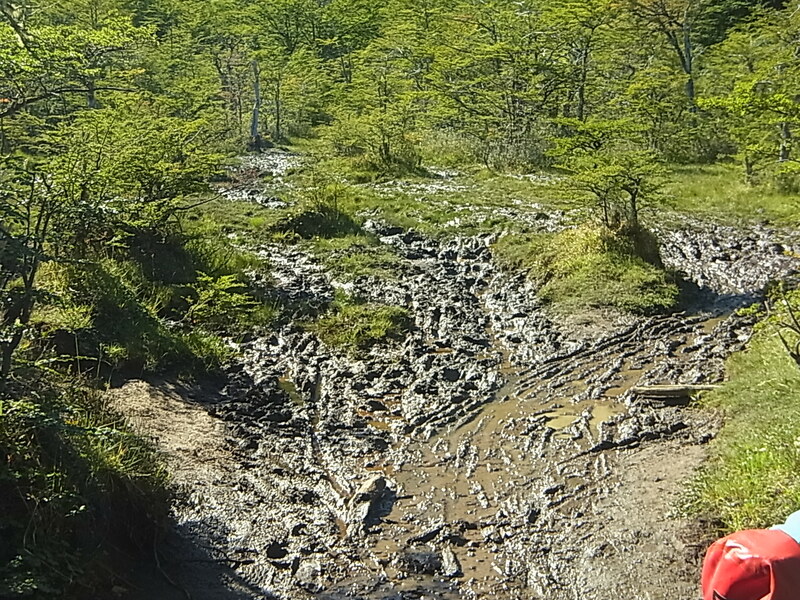 The remains go into sale for everybody – usually passing tourists – but we are not willing to pay the exorbitant prices for these leftovers. 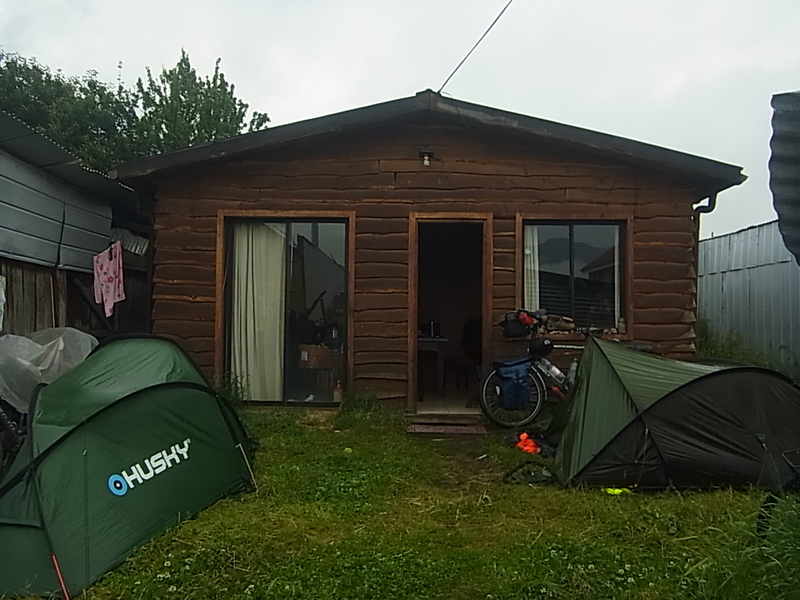 But anyway, we reach Villa OˋHiggins still healthy and are welcomed by more than 50 cyclists (some of them good friends by now) lingering around this tiny little village with maybe 500 inhabitants, three Campings and 20 hostals. 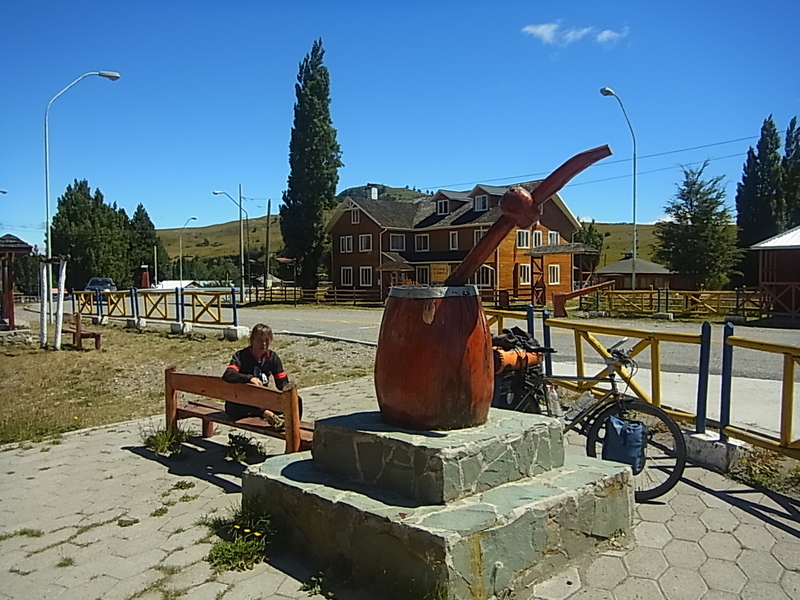 The reason for this crowd is an easy one – like weˋve mentioned previously from here on just cyclists and backpackers can continue their way to Argentina and the crossing between the two countries is a little bit adventurous. 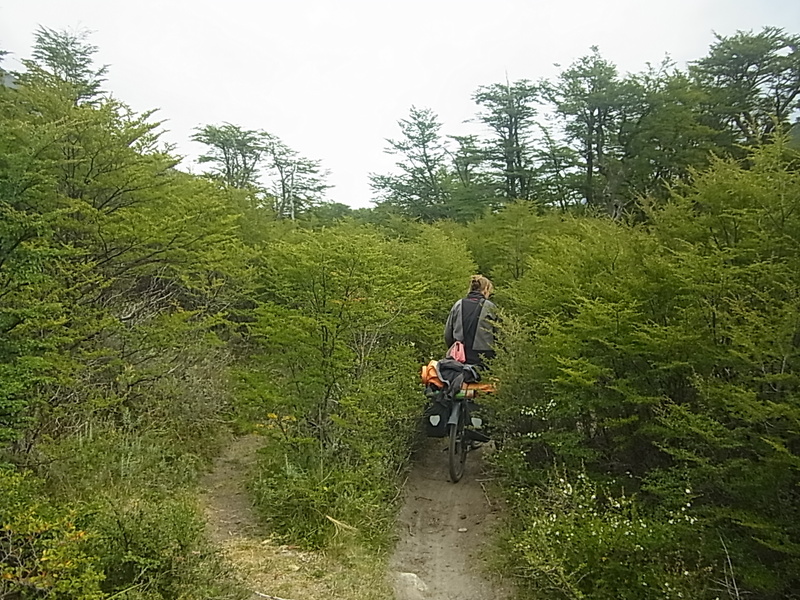 We get the chilean exit stamp in Candelaria Mancilla, after a turbulent trip with some victims of seasickness and start pushing the bicycles uphill. 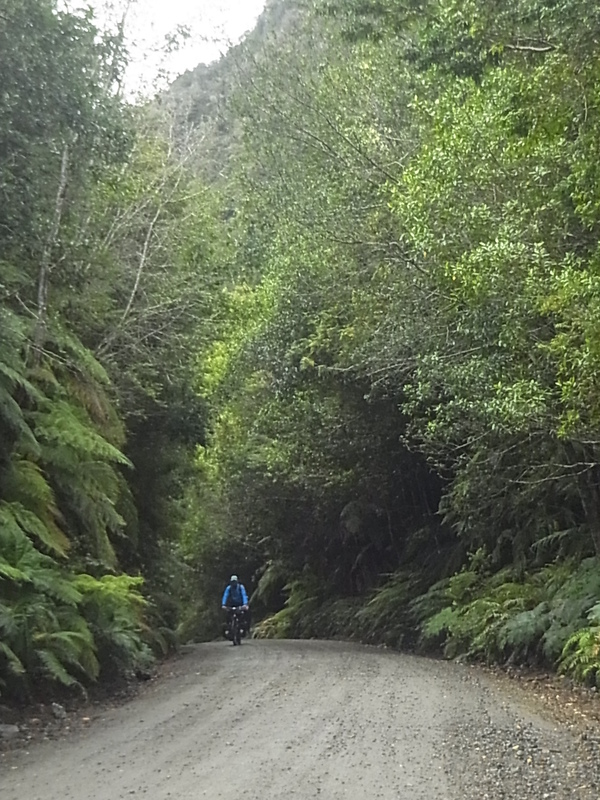 15km and no way to cycle the first five ones. 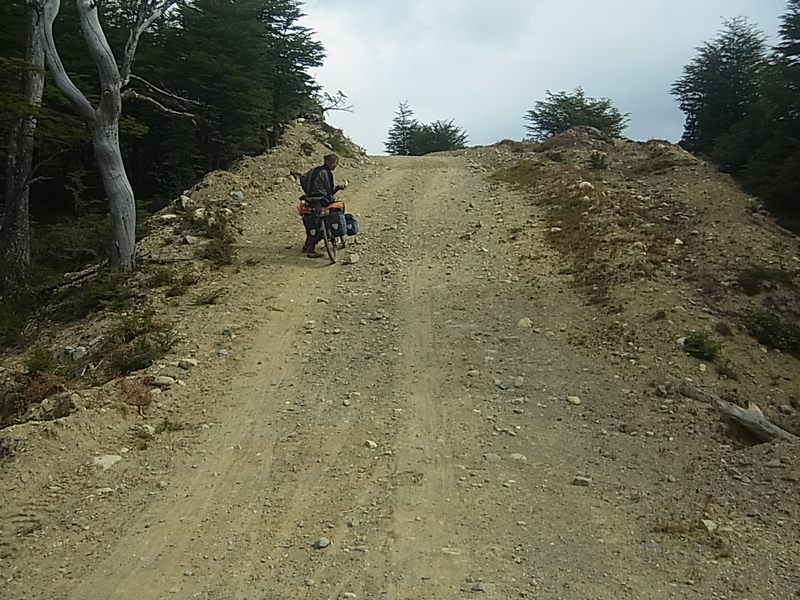 Deep loose sand and rocks, steep and on top we have to help an elderly French man with knee-problems who canˋt walk properly. 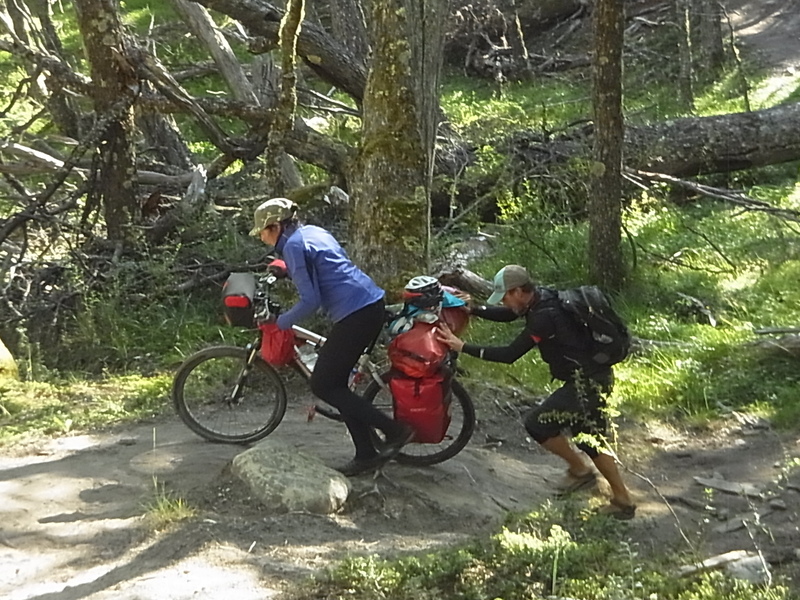 Bram and two other guys bring his bicycle uphill in turns, therefore they do this part two times, whatˋs quite exhausting. 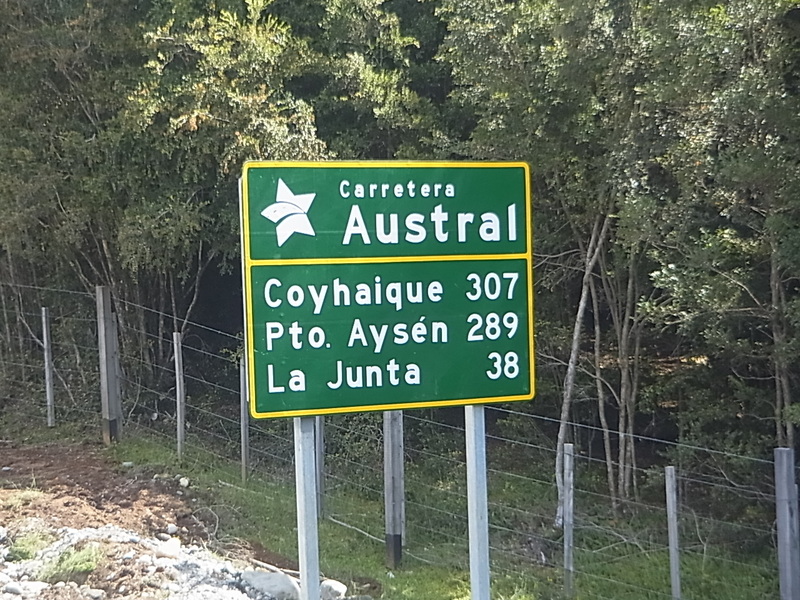 But finally itˋs done and we cross the deserted argentinian border, just recognizable by a big sign in the middle of nowhere. 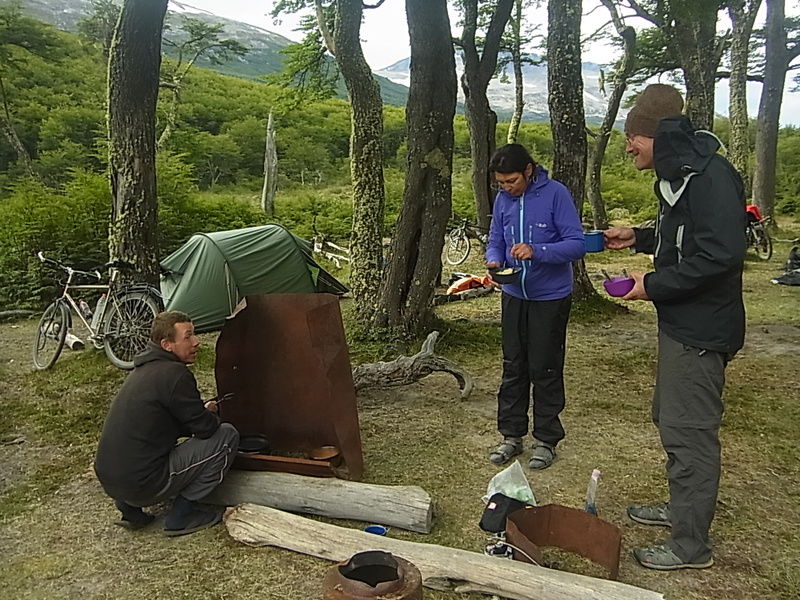 Although itˋs quite windy, we decide to camp out here with another couple, Philip and Anette before we start out to do the second part of the track. 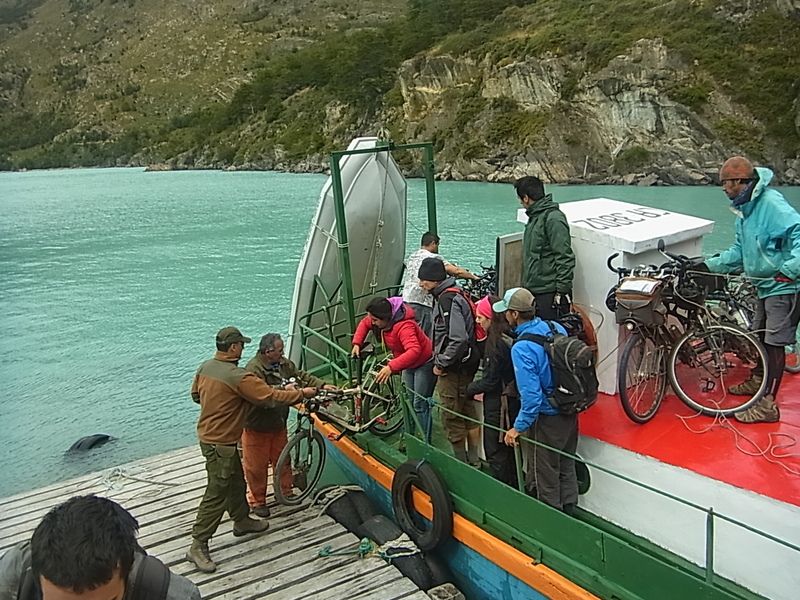 The next part is for sure not made for bicycles with luggage and we are glad that our small group of four works very good as a team to pass the biggest difficulties. 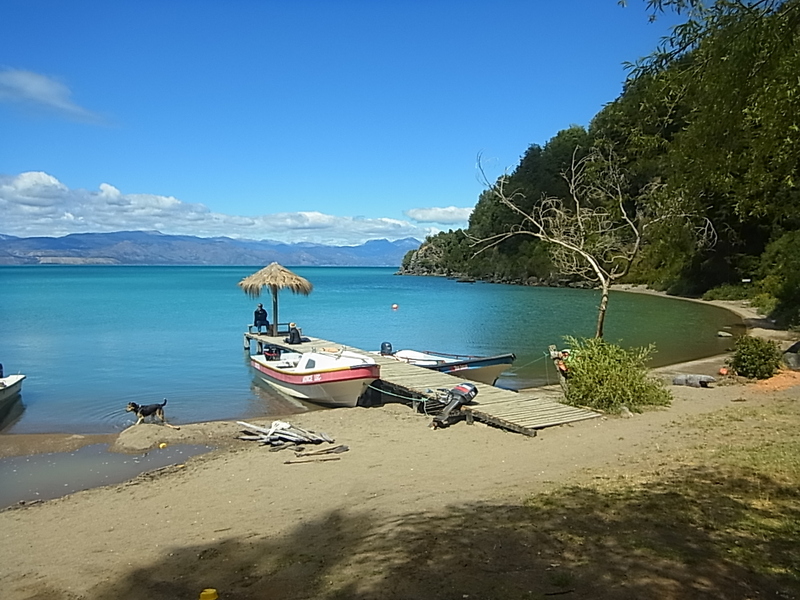 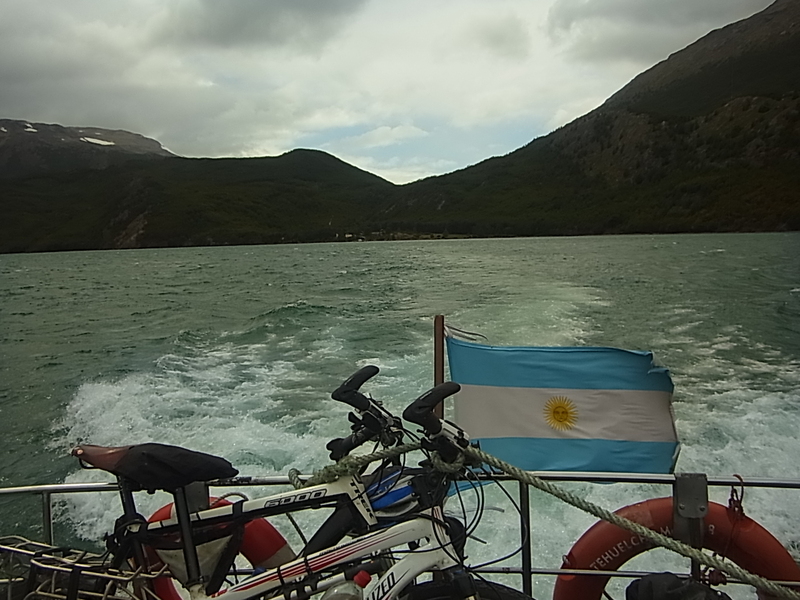 Down at the shore of the Lago del Desierto we get the entrance stamps for Argentina, have to wait a couple of hours for the boat which brings us to the other side and finish at last our country-crossing by reaching El Chalten, the first argentinian village 37km after the Lago. 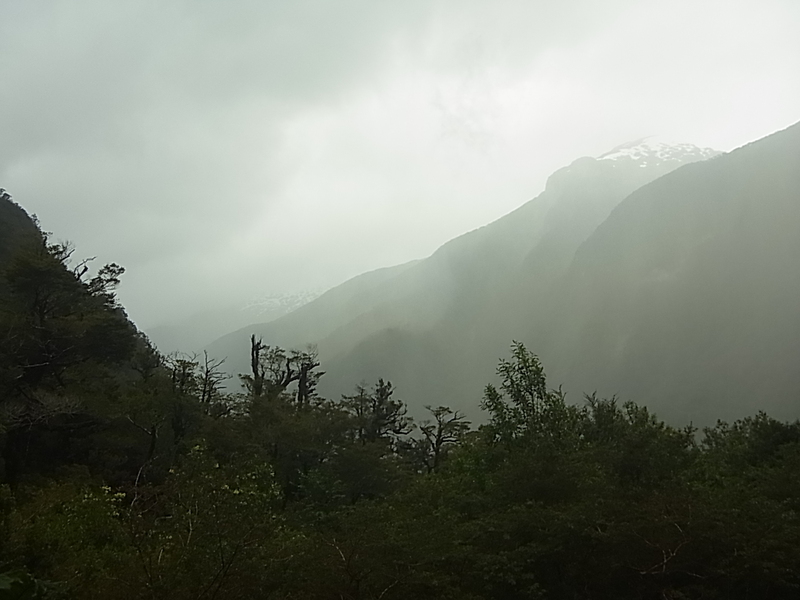 We managed the first 400km of the Carretera quite well, got wet only twice (whatˋs pretty good for this stretch 😉 ) and after one weeks rest we head out for the next 600km down south to Villa OˋHiggins. 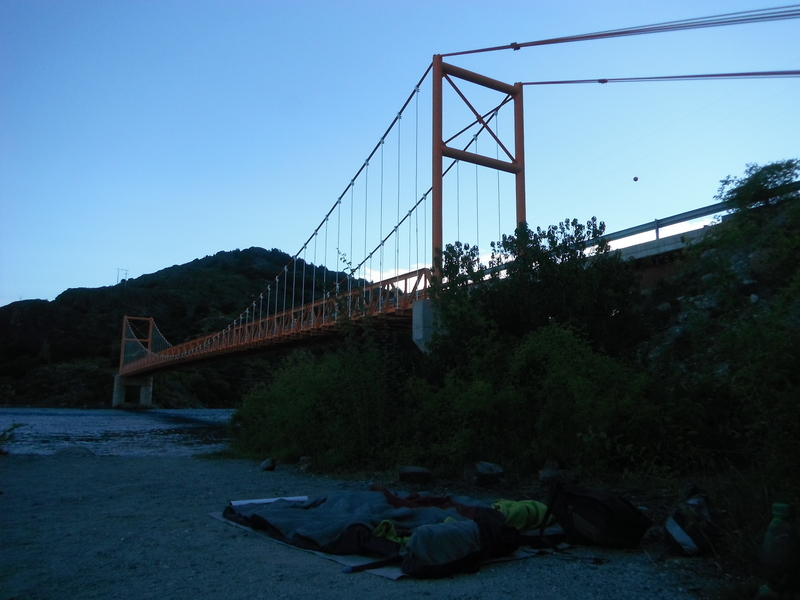 We start cycling pretty late, so the first day is only getting out of the city before we look out for a campplace. 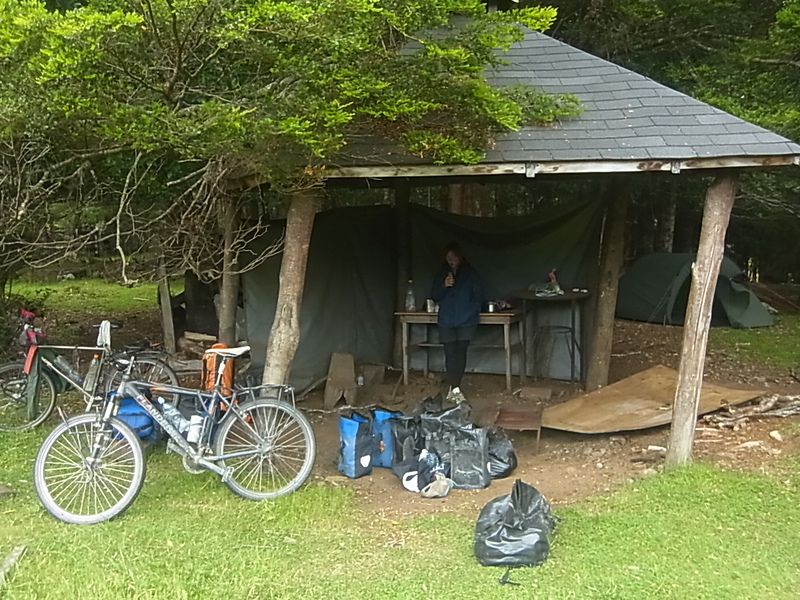 Although the sunˋs still shining, the upcoming wind is chilly and we are glad to find a shed where firewood is kept and can put up the tent out of the fierce wind. 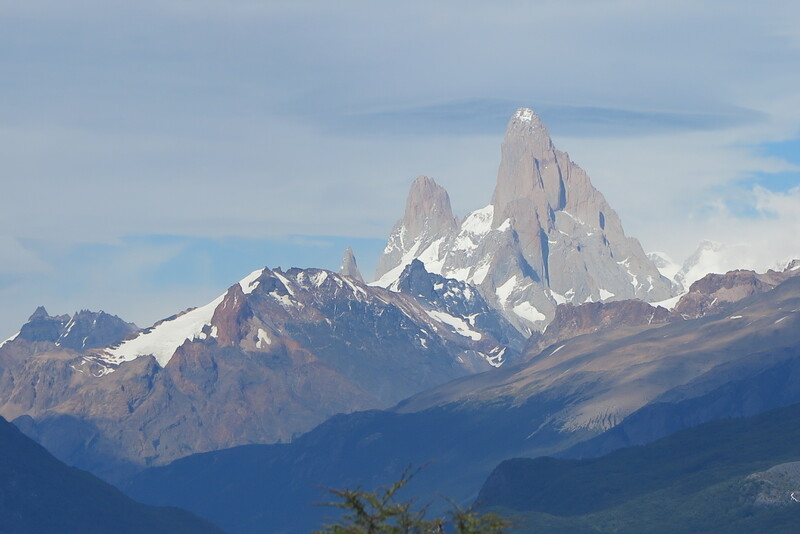 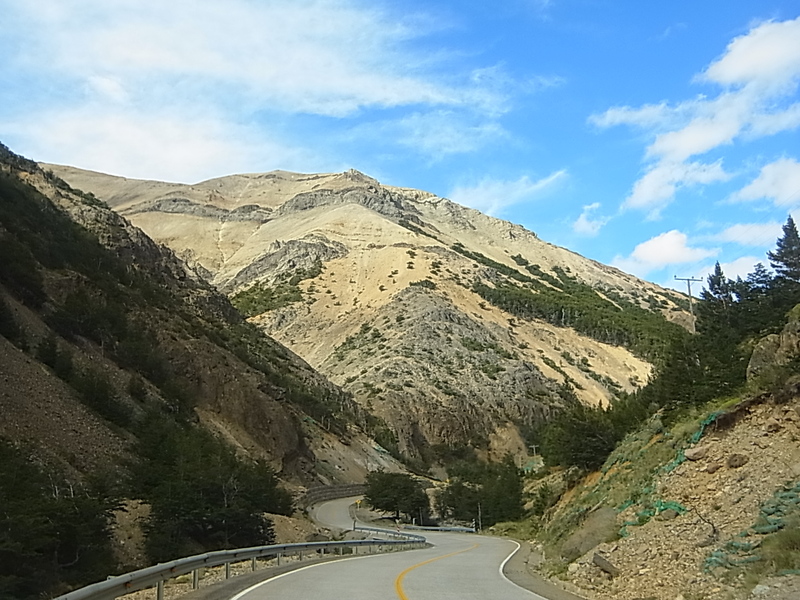 The scenery on the road becomes more and more impressive with each passing km, changing once again from flat open green spaces to colourful mountains the closer we come to the Nationalpark Cerro Castillo, the first of many natural highlights along the way. 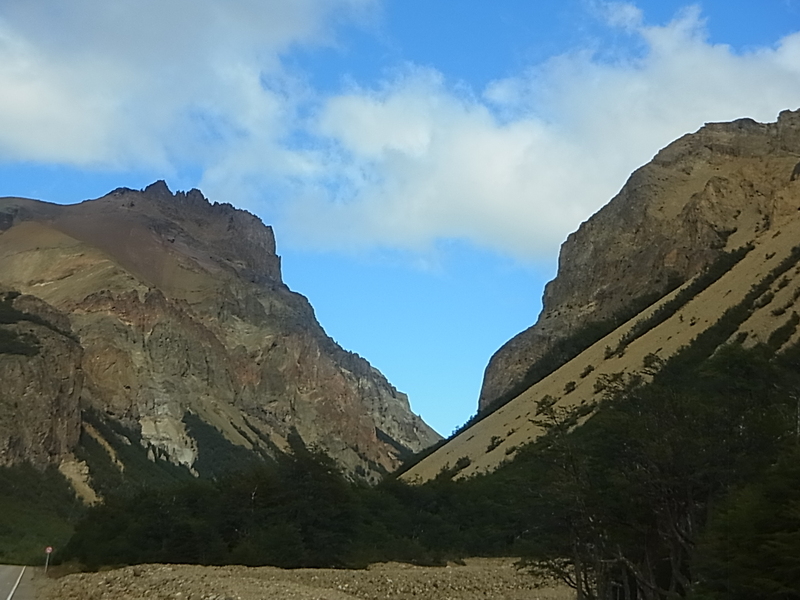 Halfways through the NP we cross the Portezuelo Ibanez and get a wonderful view on the Cerro Castillo (the mountain) before it goes down on the “Cuesta de Diablo” to the village with the same name. 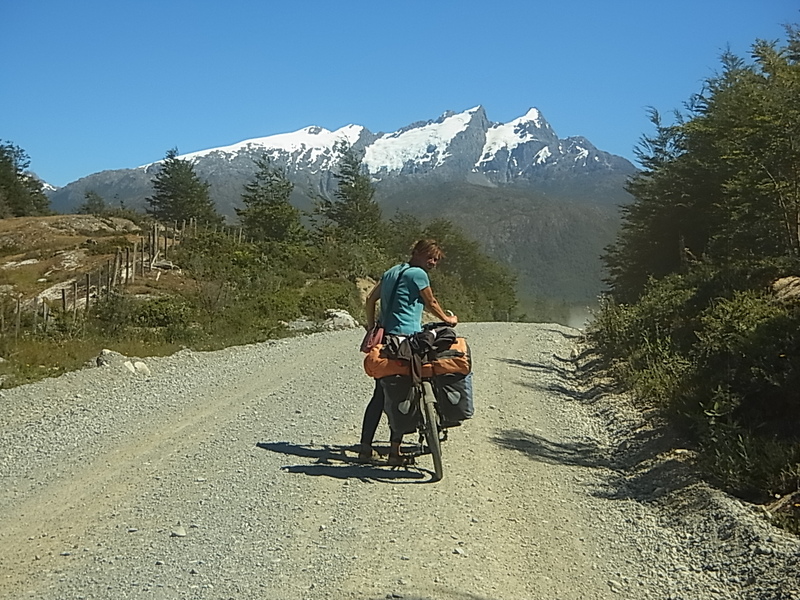 Here we have to say a final good-bye to the paved road and to the sun as well, the following days bring a fast changing mix of strong wind, grey clouds, occasionally cold showers and some sunshine. 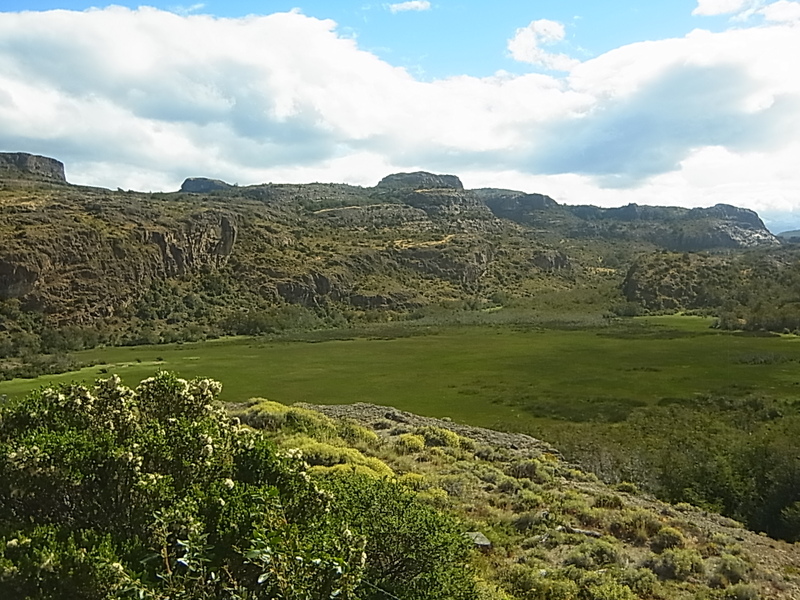 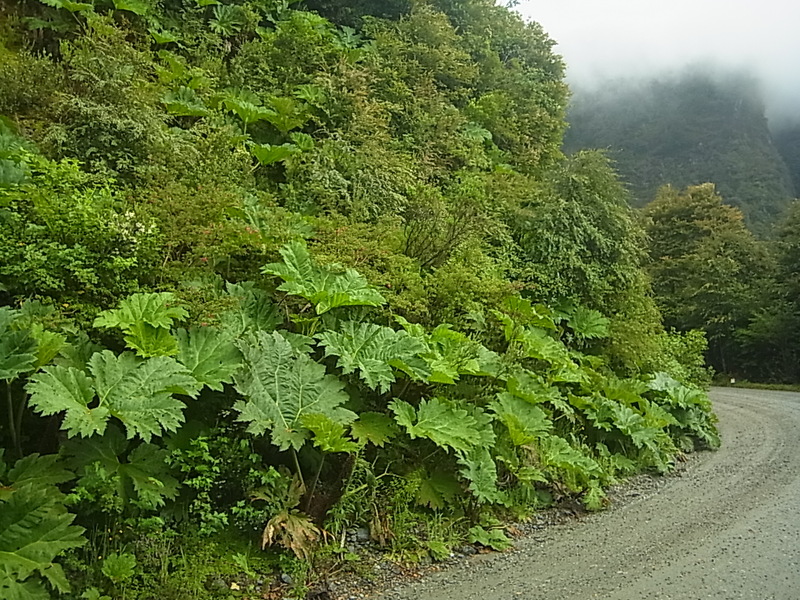 The vegetation – adapted to the cold and wet – is now dominated by small dense bushes, growing in every niche amongst windcarved rocks and small areas of thick green grass. 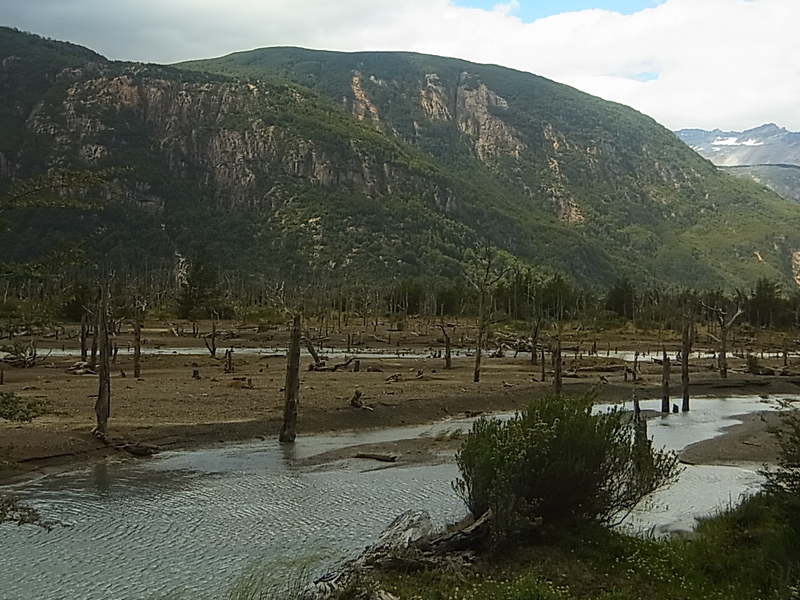 Behind a small mountain range we enter swampland, fed by numerous water streams and “decorated” with dead trees. 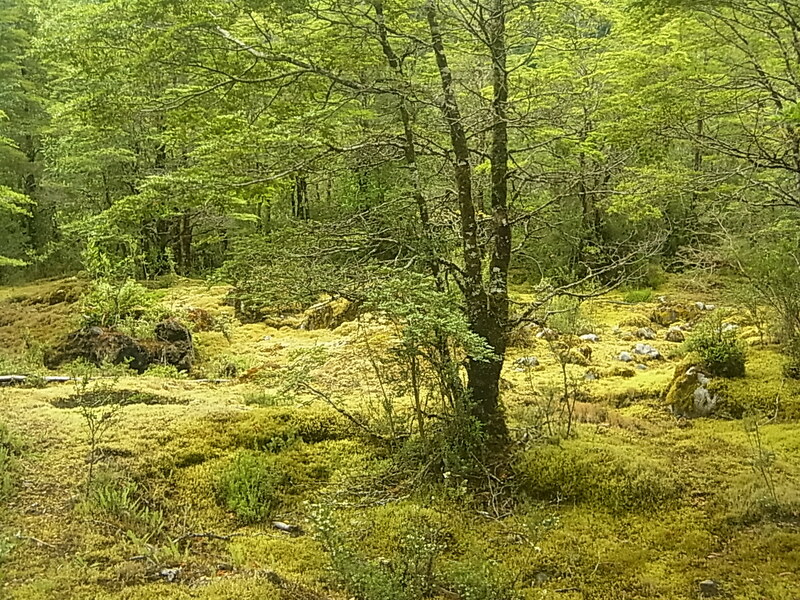 The logically called “Bosques muertos” are victims of the last big eruption of the nearby Vulcano Hudson and although the picture is not the usual vivid abondance, it has some kind of strange beauty. 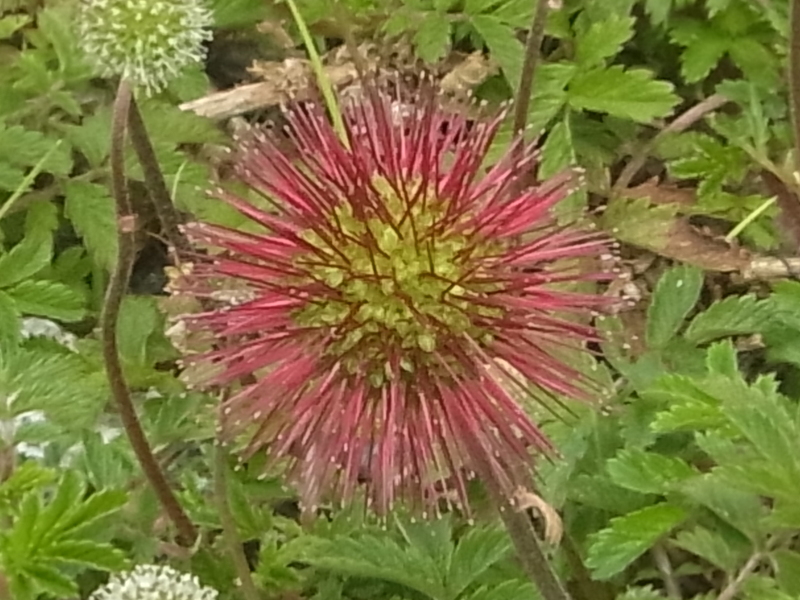 It is like around every corner mother nature throws another suprise at us just to show off with the endless variations she can create. 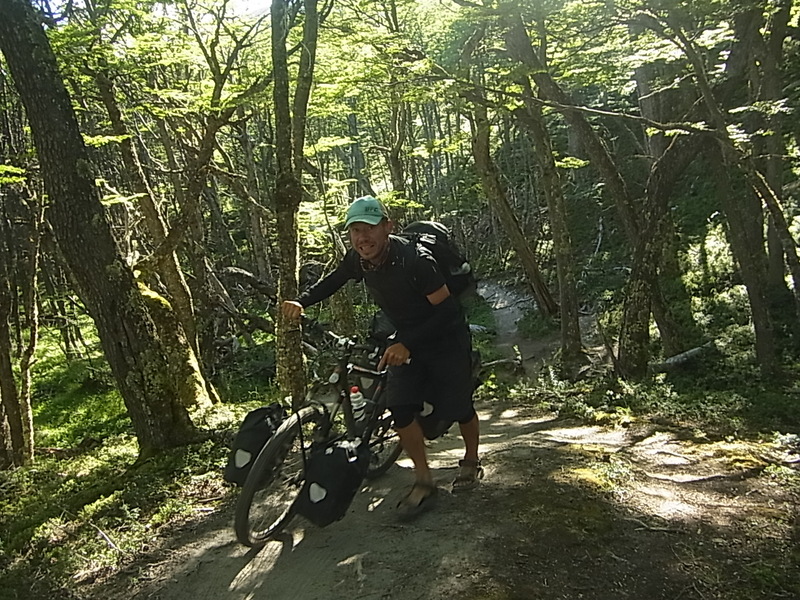 then we start talking to a lot of people and find eventually a far better possibility to visit the Capilla: Cycling 5km out of town, descending 1.5 steep! 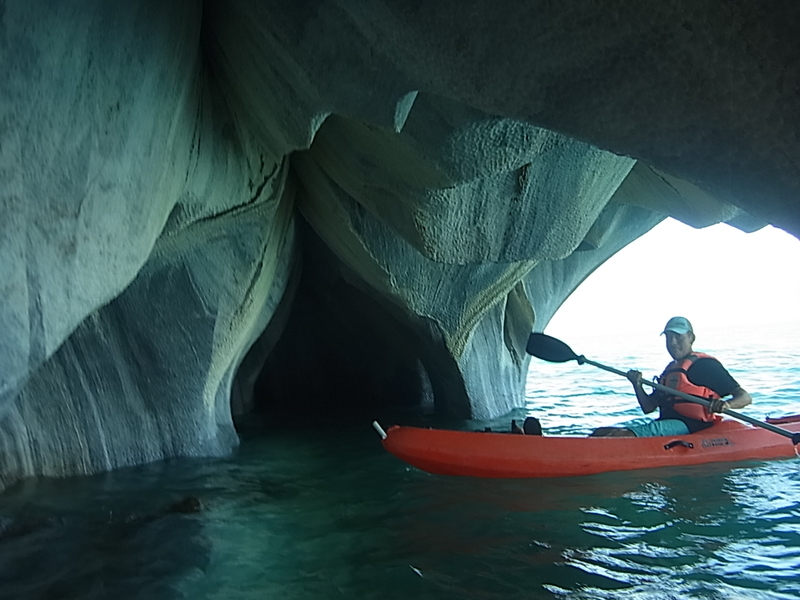 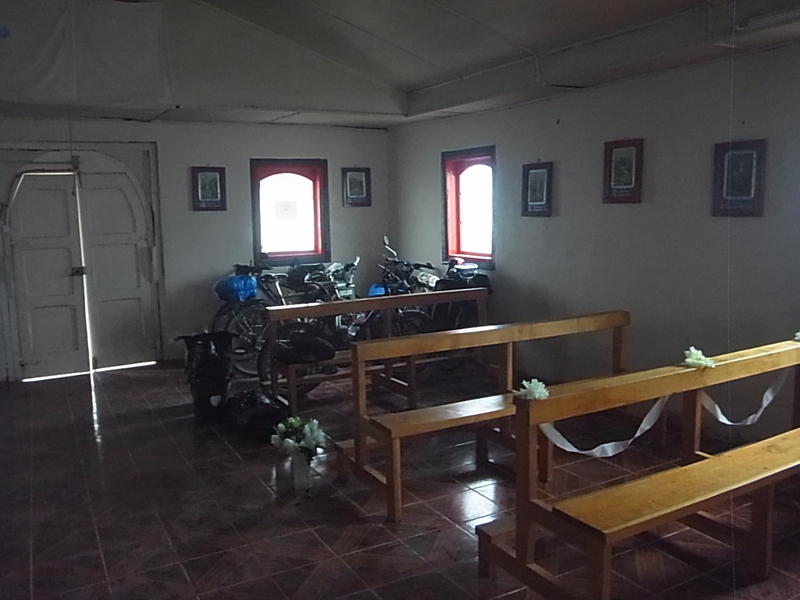 kilometers from the main road to the less known Bahia Mansa and visit the Capilla by kayak. 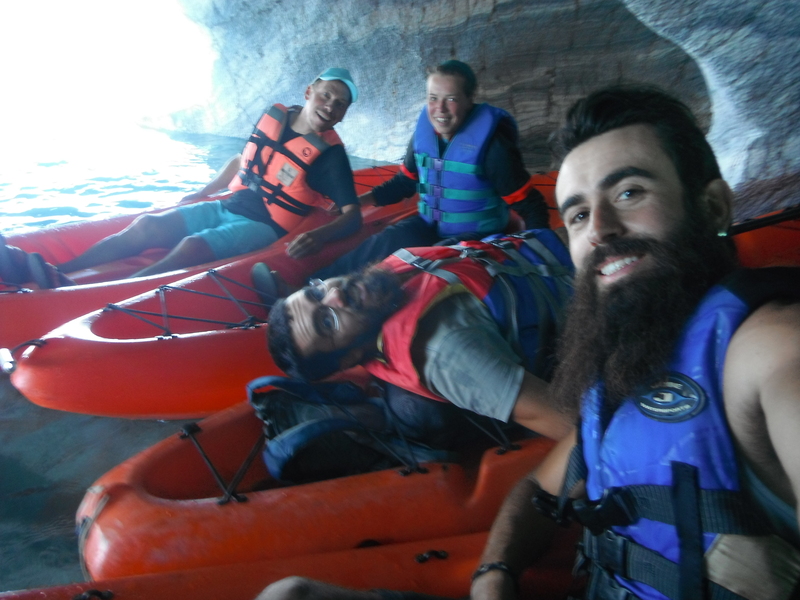 Paddling against the waves is a little piece of work but when we arrive at the Capilla we are more than happy that we are doing it this way instead of the boat-trip. 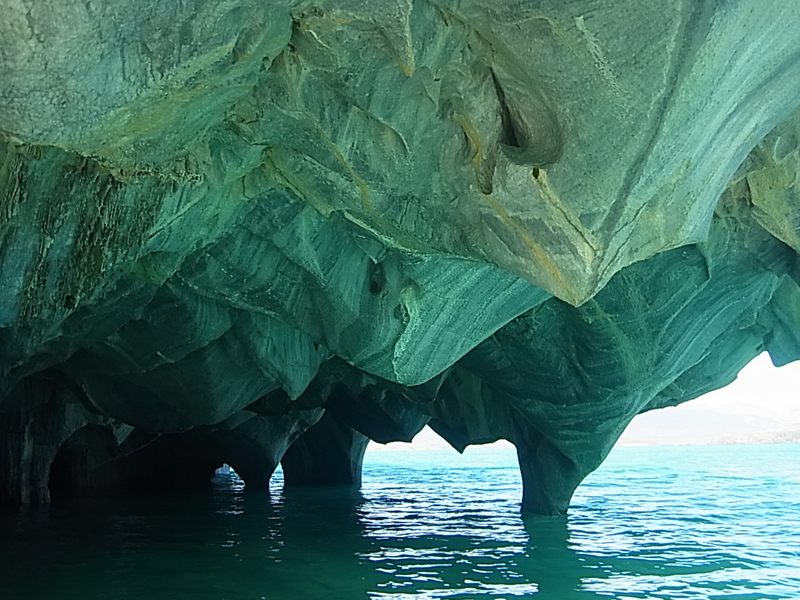 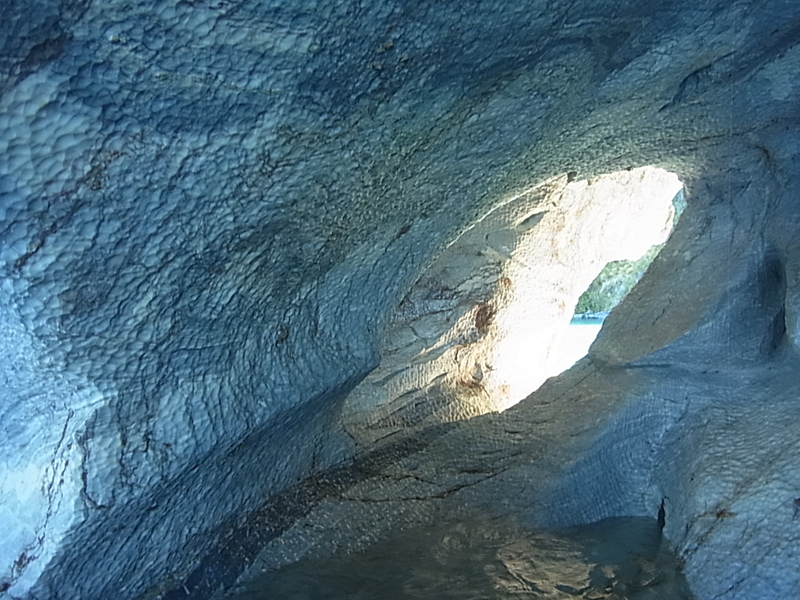 The Capilla consists of several caves which were washed out of the marble by the water over many, many years. 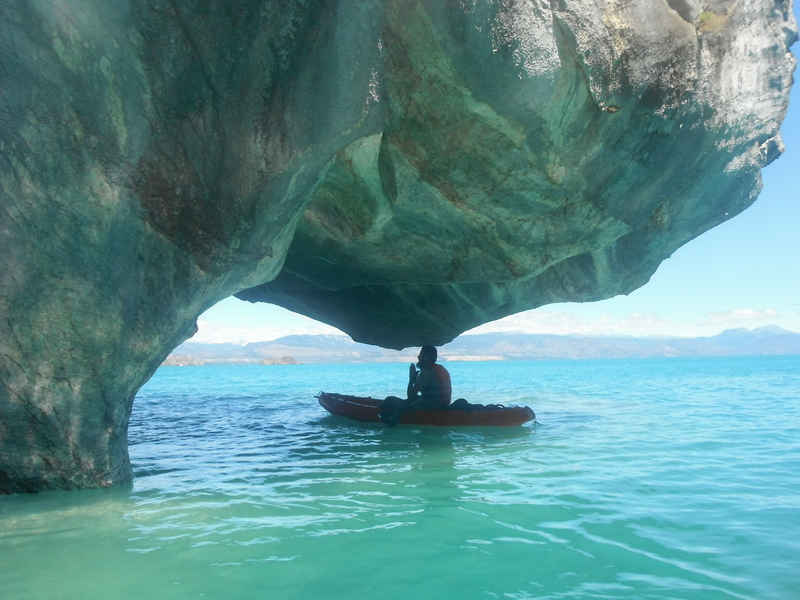 By kayak we can access most of them (while the boats just surround the outer parts) and enjoy the strange shapes, the great variety of patterns in the marble, the sun reflections on the water and the stone and even get a bath in the lake. 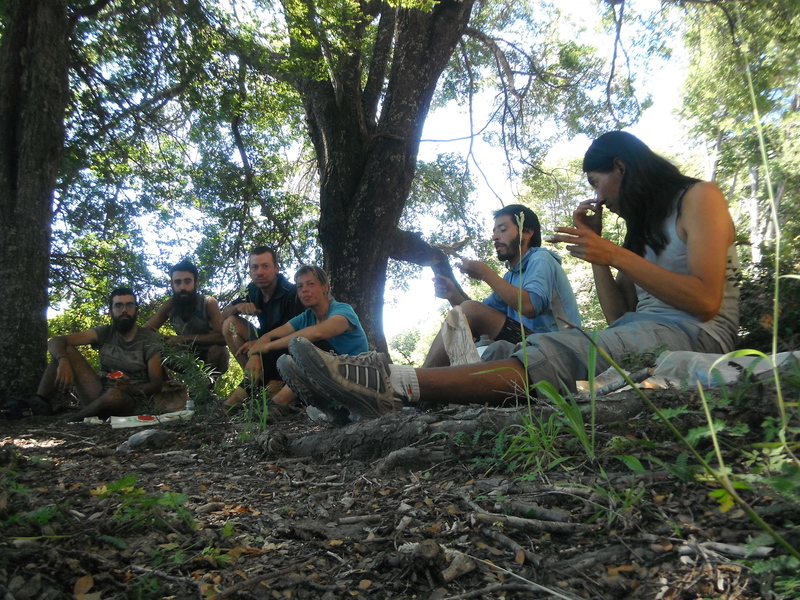 We return to Bahia Mansa tired and wet but very, very satisfied and end the day with sitting at a nice bonfire. 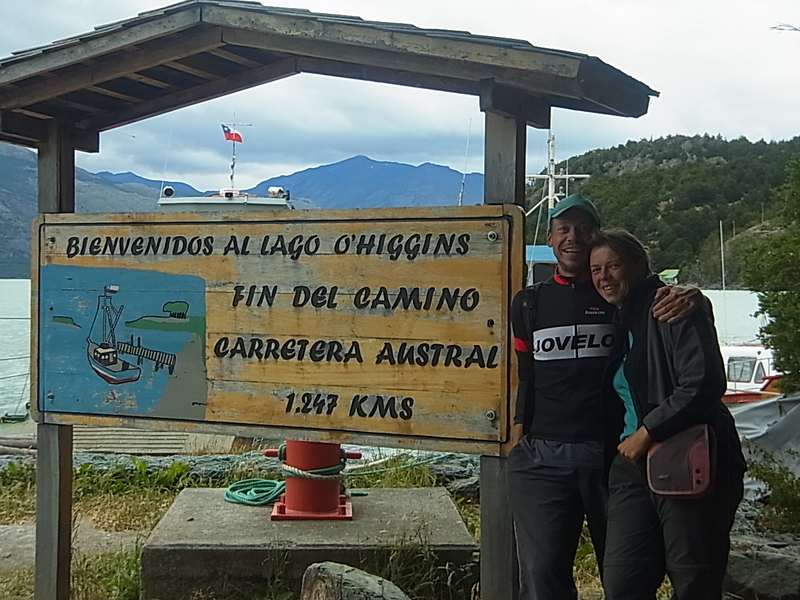 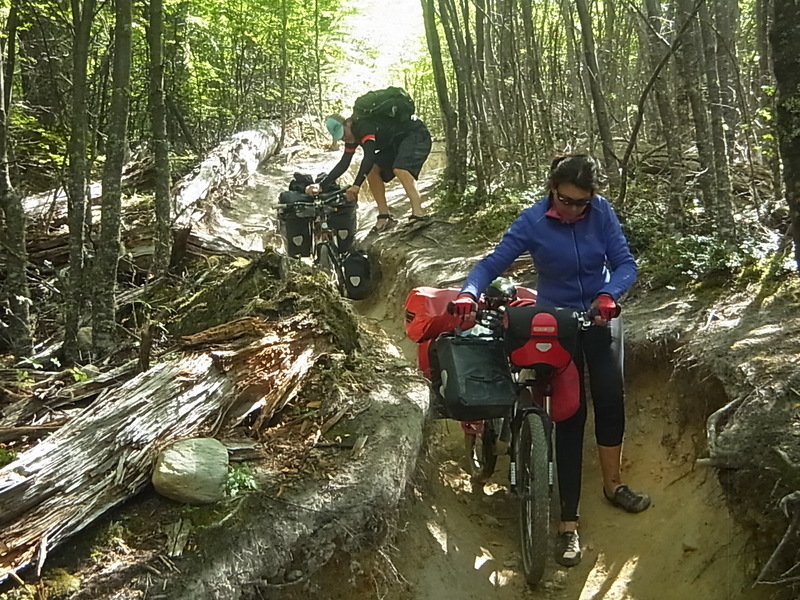 The following stretch further along the shore of the Lago stays beautiful, the sunny weather stays as well and for a nice surprise we meet Pavel and Zuzana again, a nice couple from Slowakia whom we know from the Casa de Ciclistas in Coyhaique. 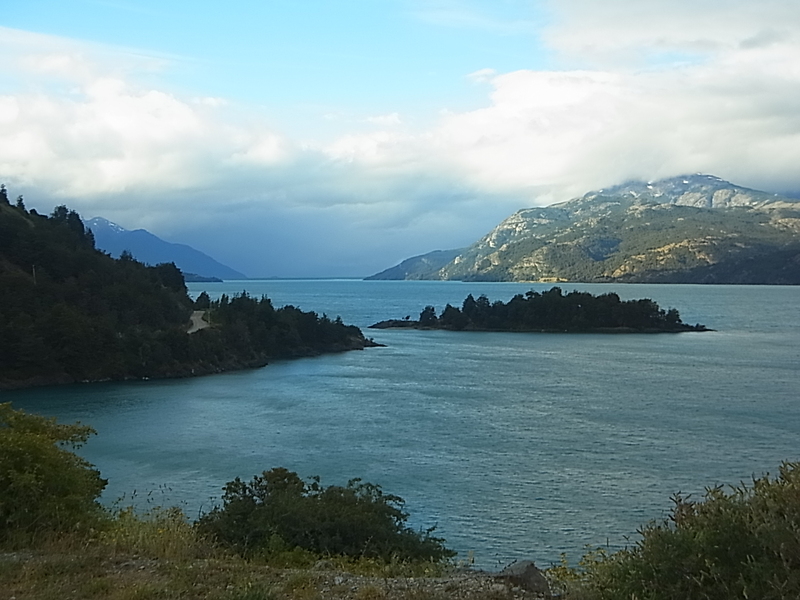 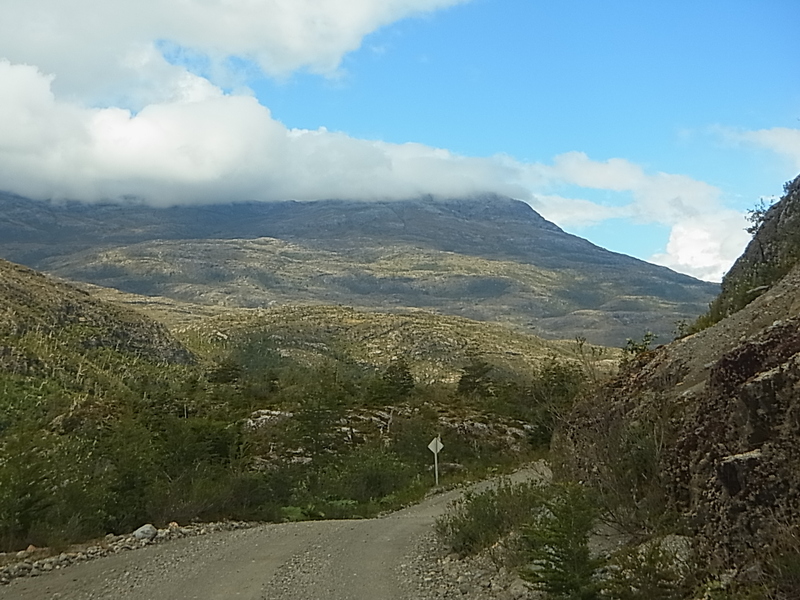 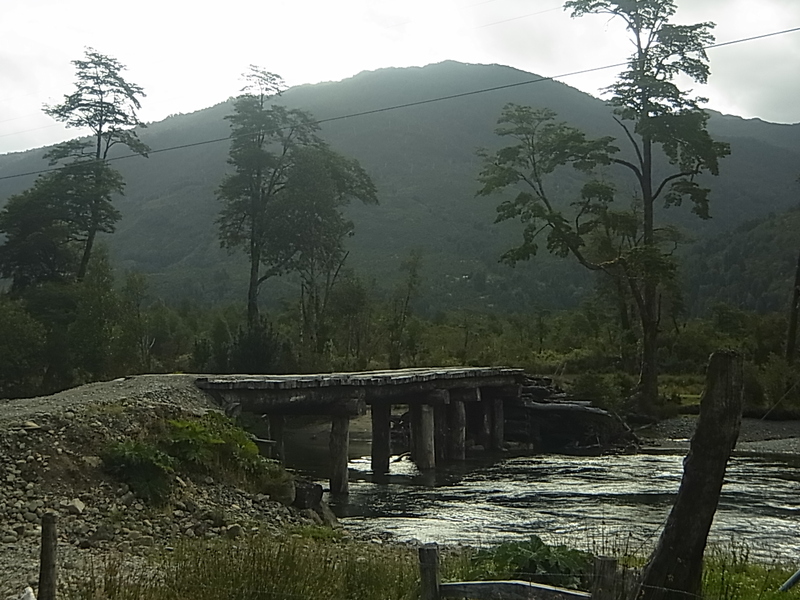 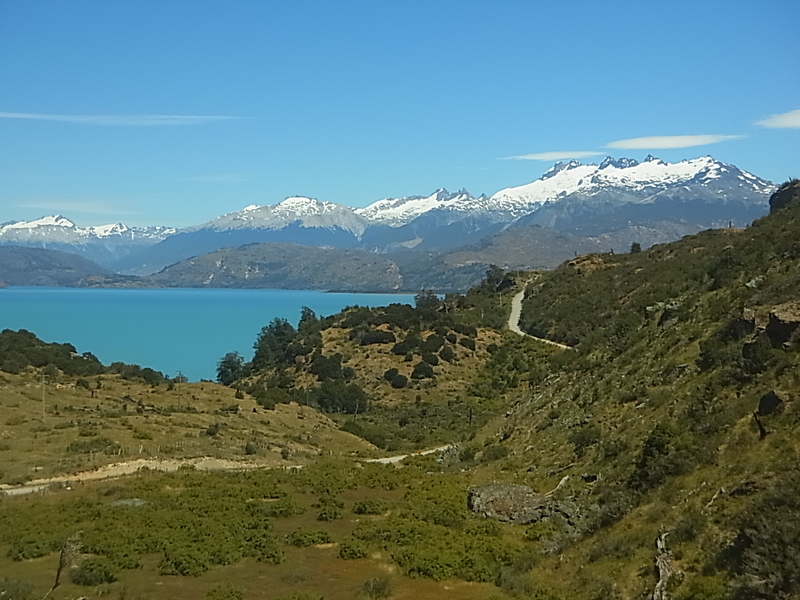 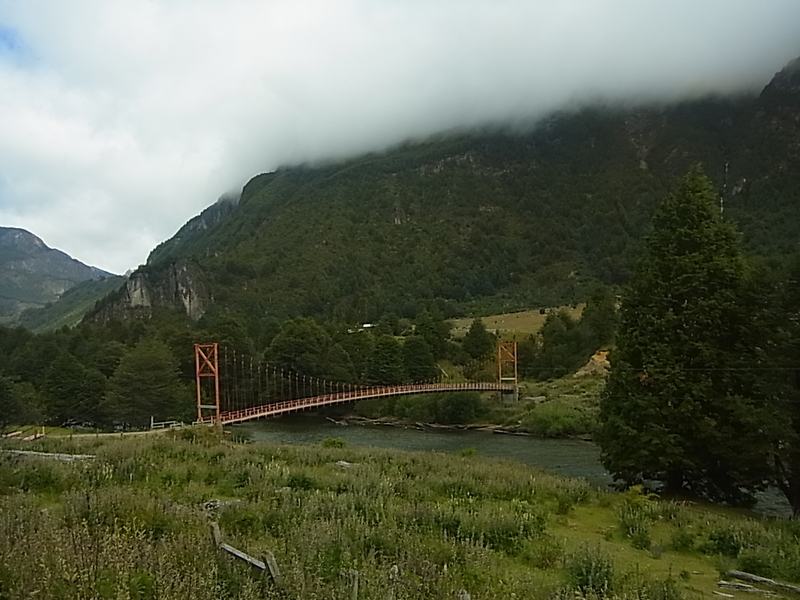 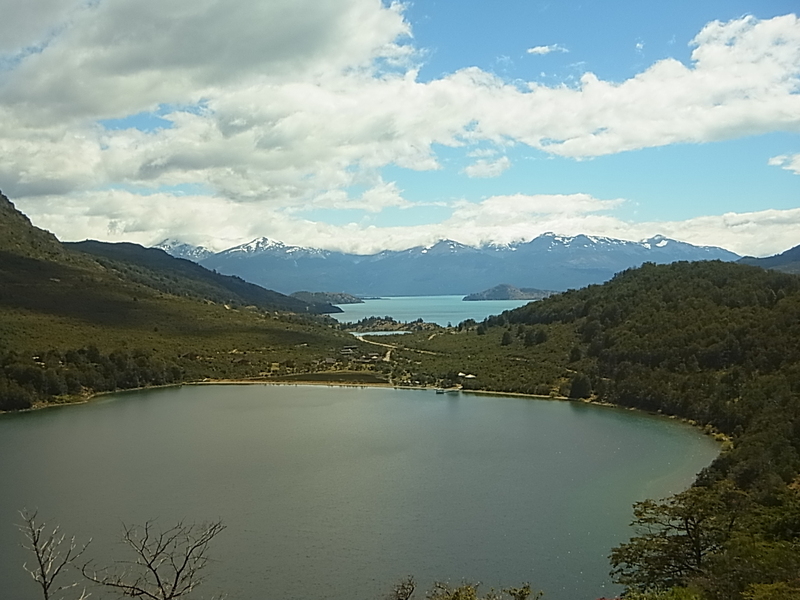 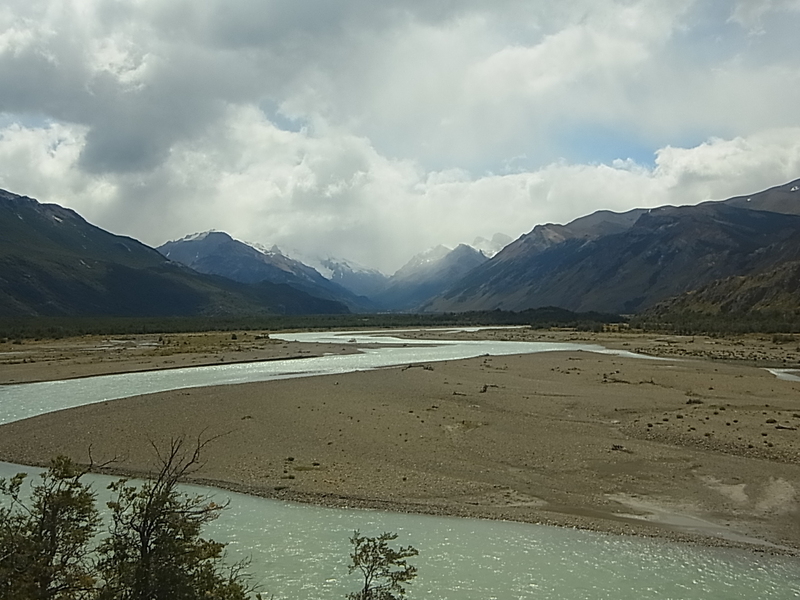 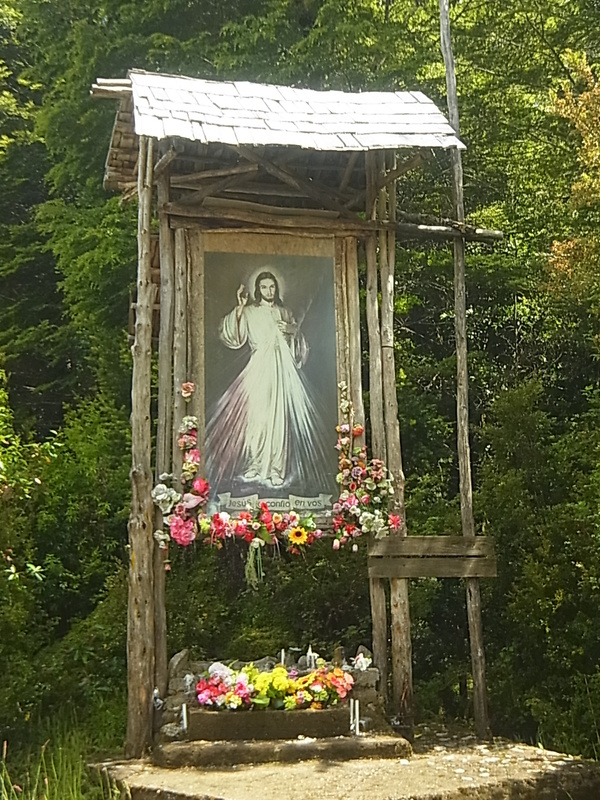 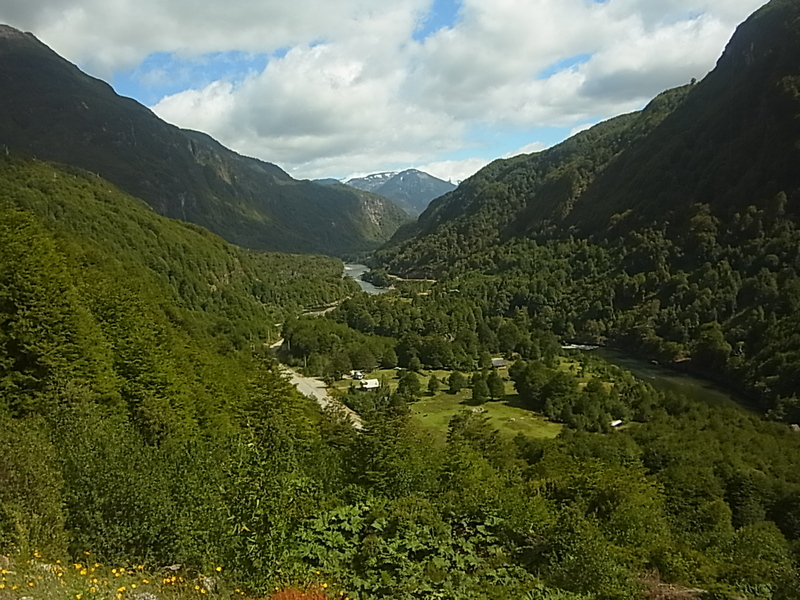 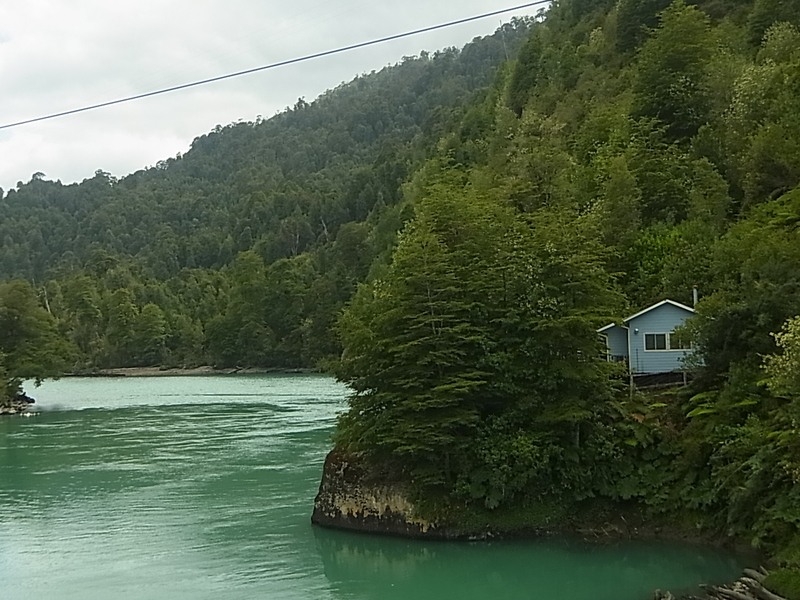 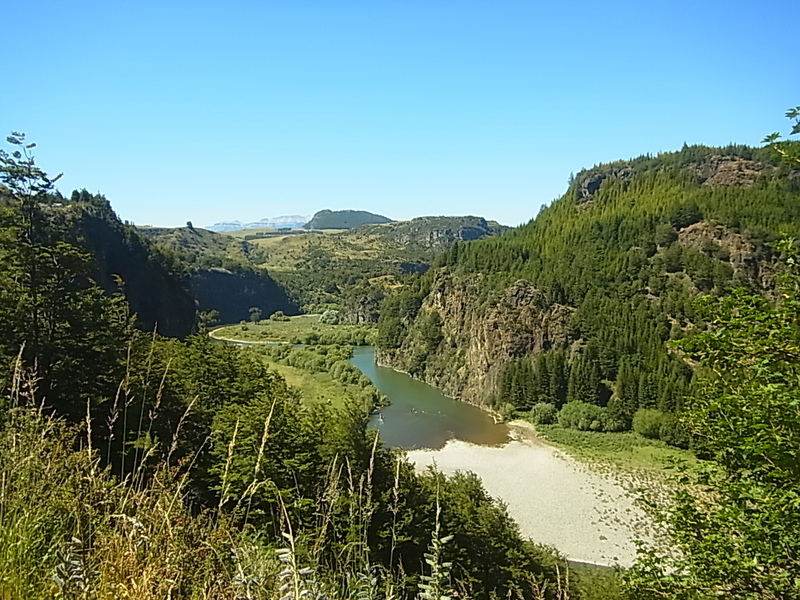 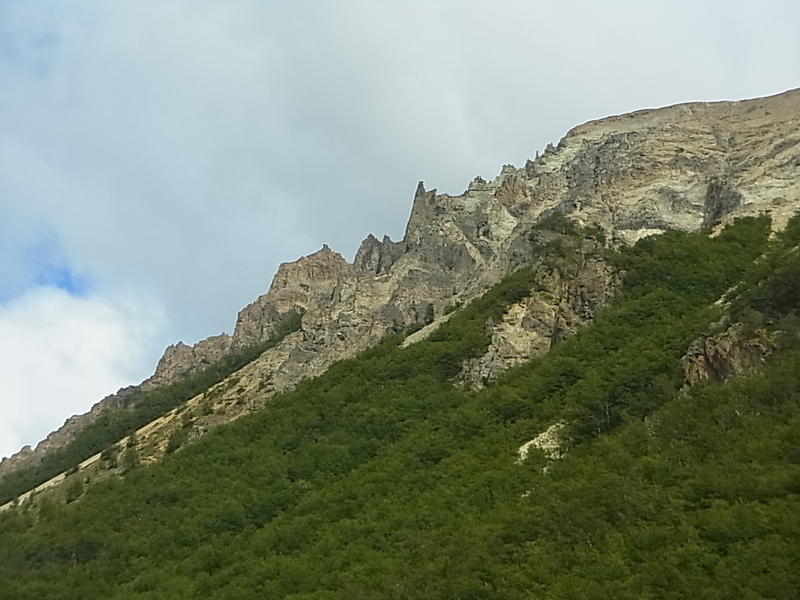 The Carretera is the only fluent connection and was build to connect the lonesome chilean Patagonia with the central part of the country. 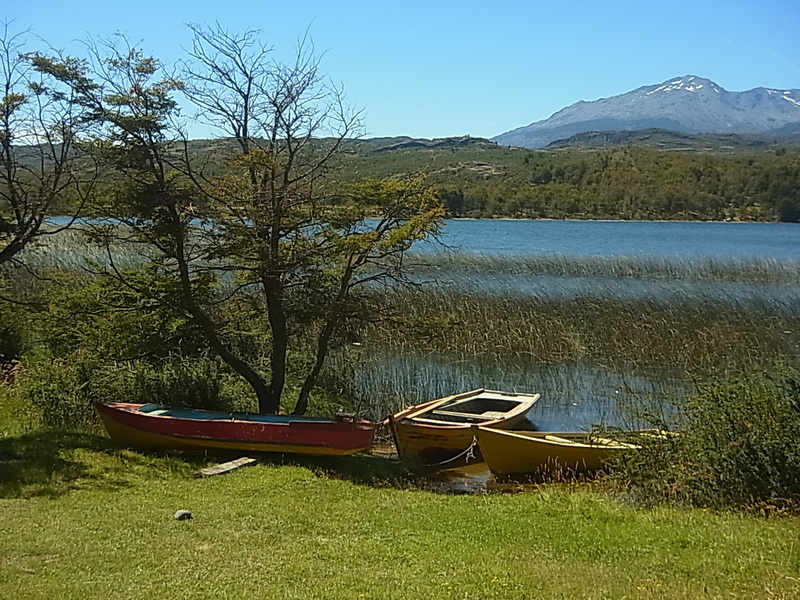 It´s a quite “young” project, started in the late 70ies and the last part to Villa O´Higgins was only established in 1999. 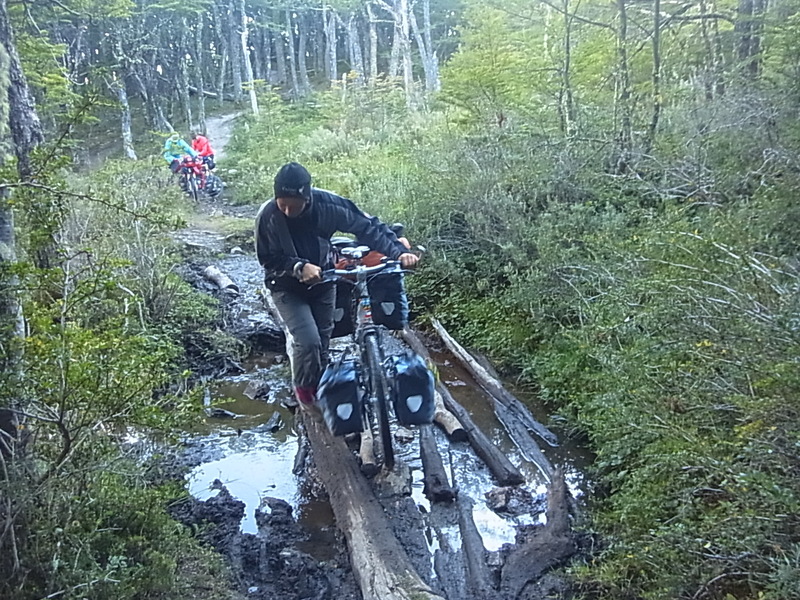 In the whole area of some thousands square kilometers live just around 100.000 people, it´s still one of the most remote parts of South America and access is even nowadays not easy. 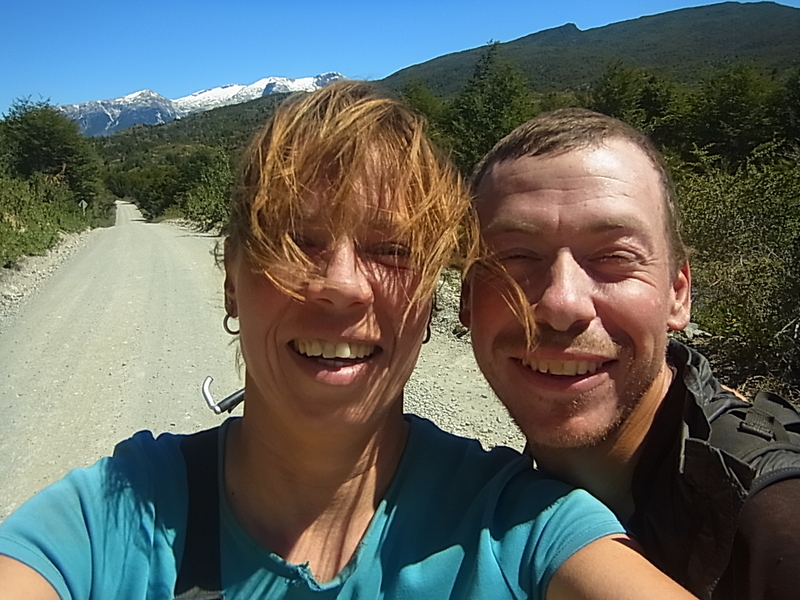 We start cycling alone, as Diego and Dieisson want to make a detour to see a glacier some km out of the way, but we agree to stay in touch by leaving notes in tourist informations or gasstations along the way until they catch up with us. 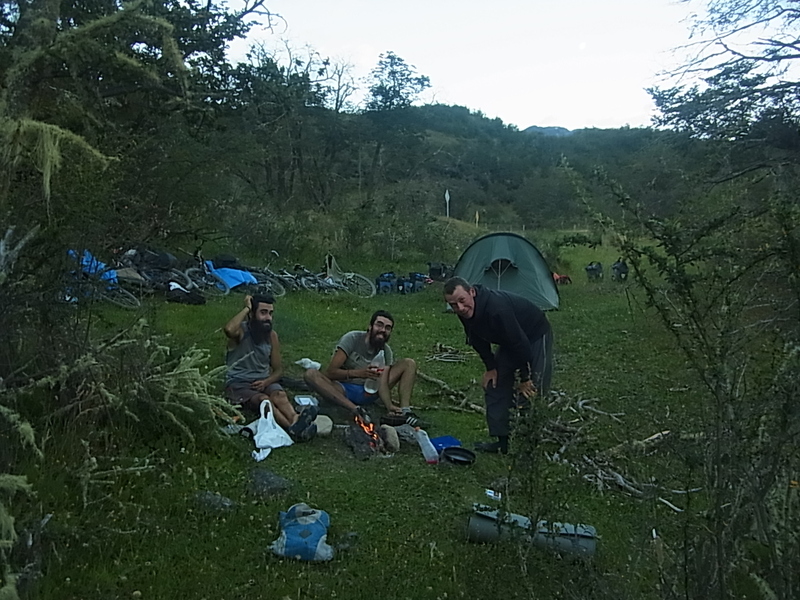 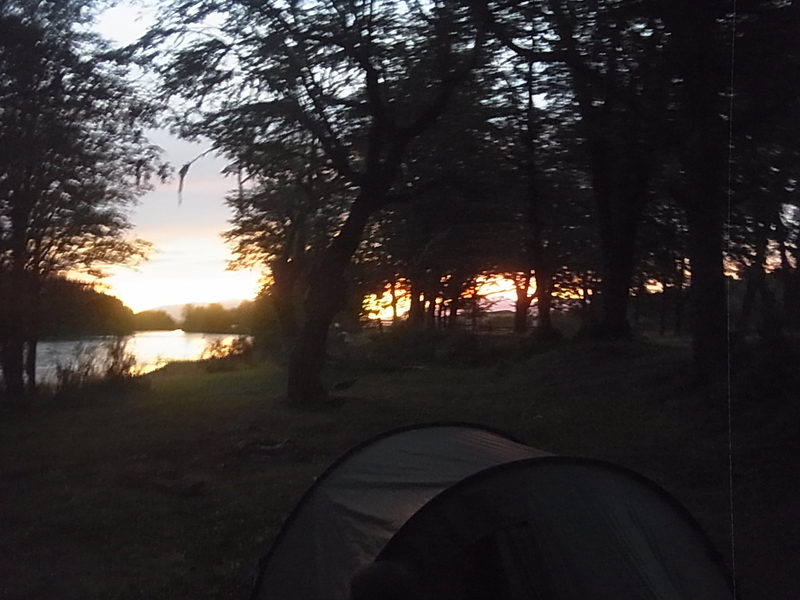 The first day passes by quite fast, again by ourselves we find our own stride as before, taking large breaks and enjoying the first km on the Carretera before we ask permission to camp at an Estancia. 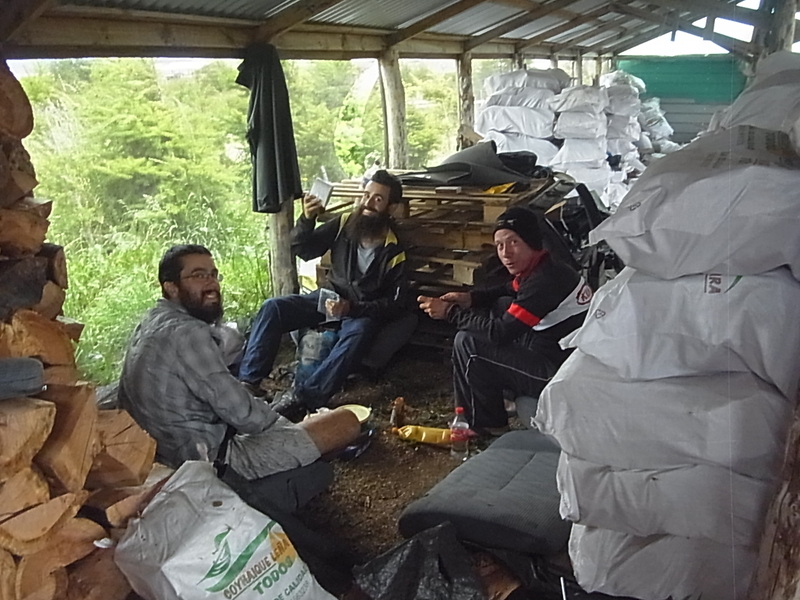 No problem like usual and funny enough, we camp next to a milking station and cheese factory, this time for cows and not for goats but it still reminds us of our time at the goat campo and we get a little bit sentimental. 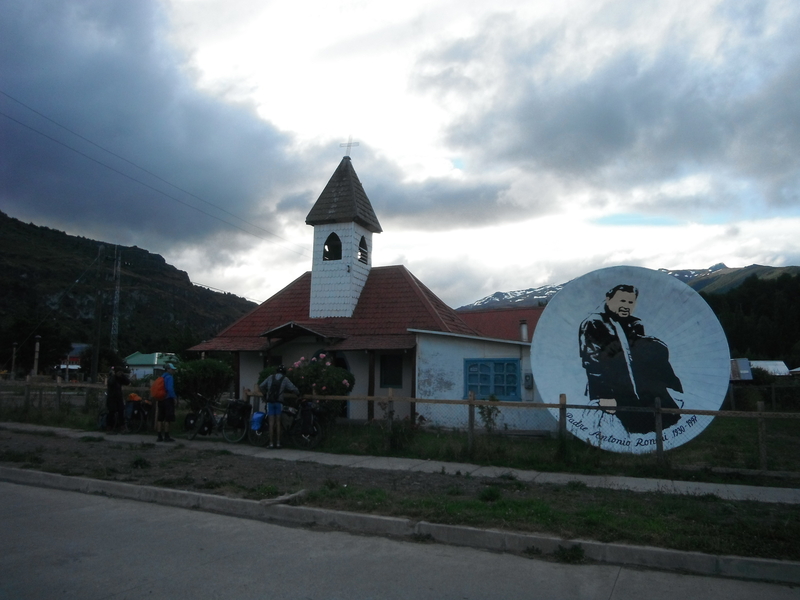 Saul tells stories of his childhood and about the life before the Carretera was build and it´s astonishing how people got the idea to populate this area. 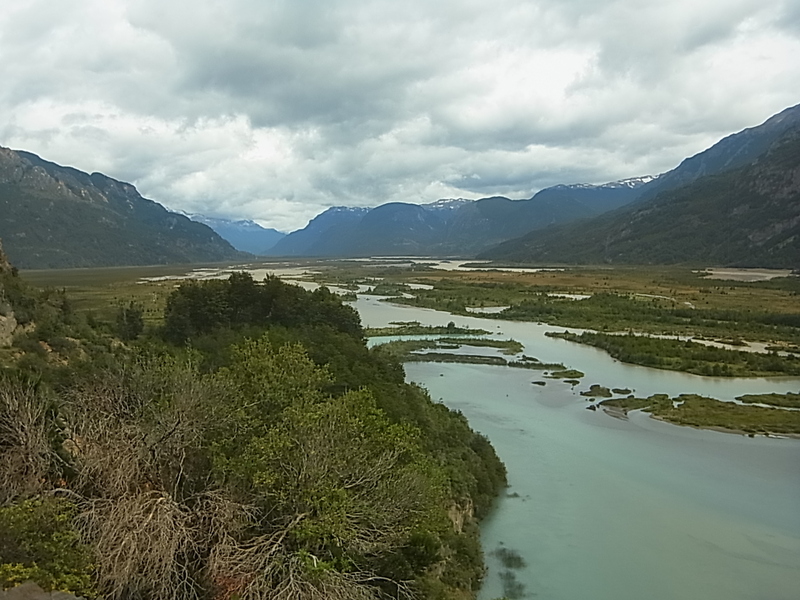 For many years the only access to bring in goods was by several day-long boat trips along the pacific coast or a crossing of the Andes to the argentinian part of Patagonia. 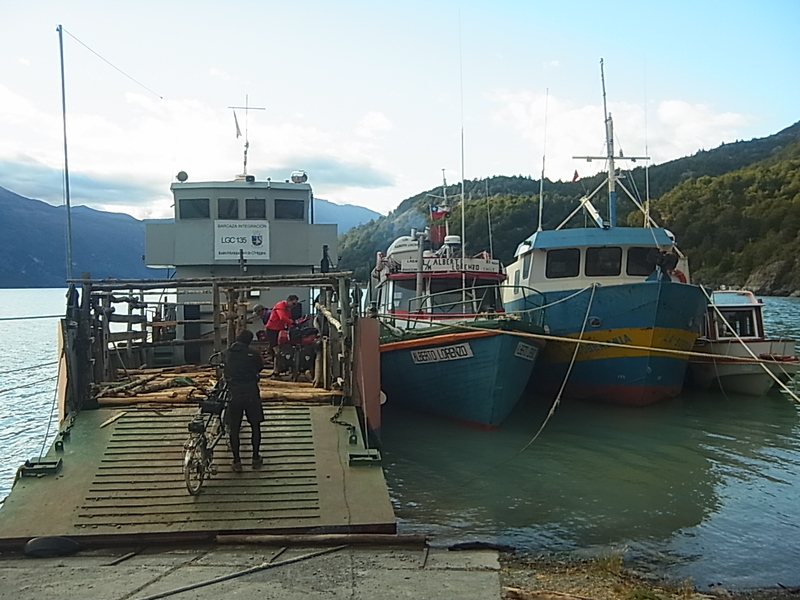 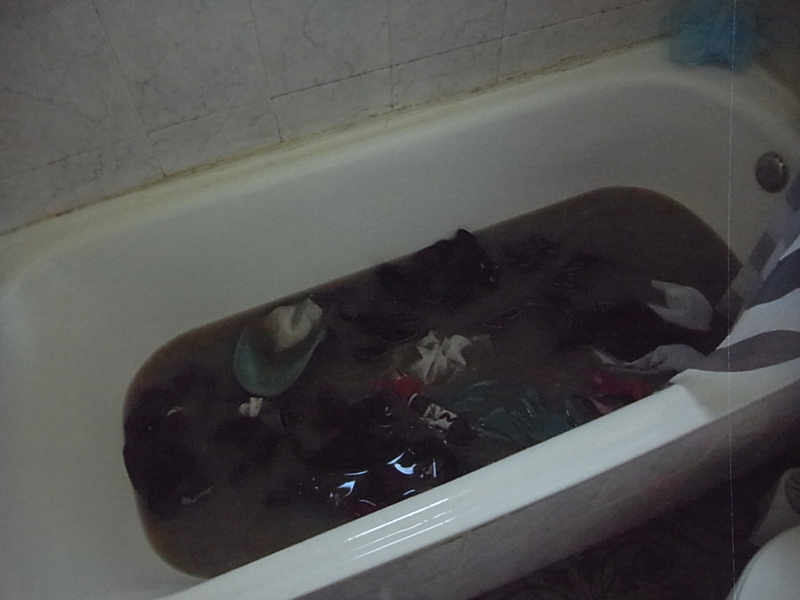 The 20km trip to the next village La Junta took two days on horseback and by boat while today it´s 20 minutes by car. 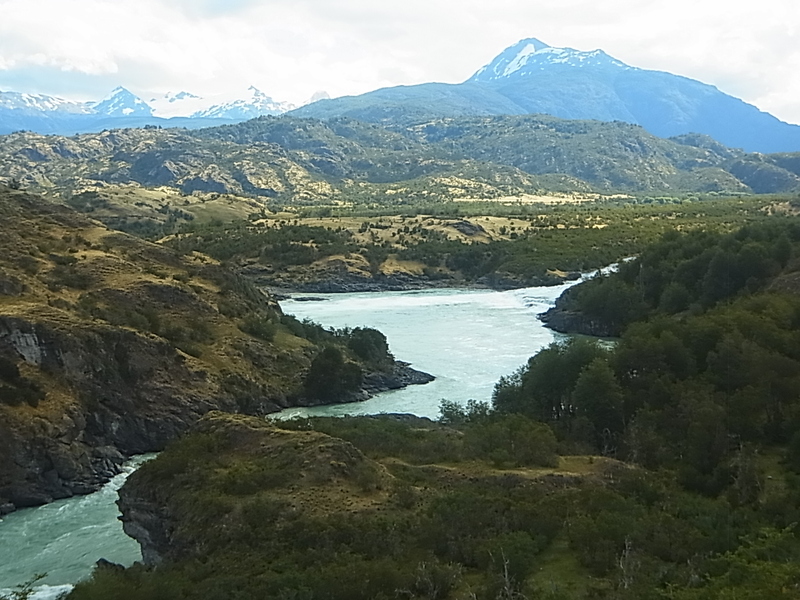 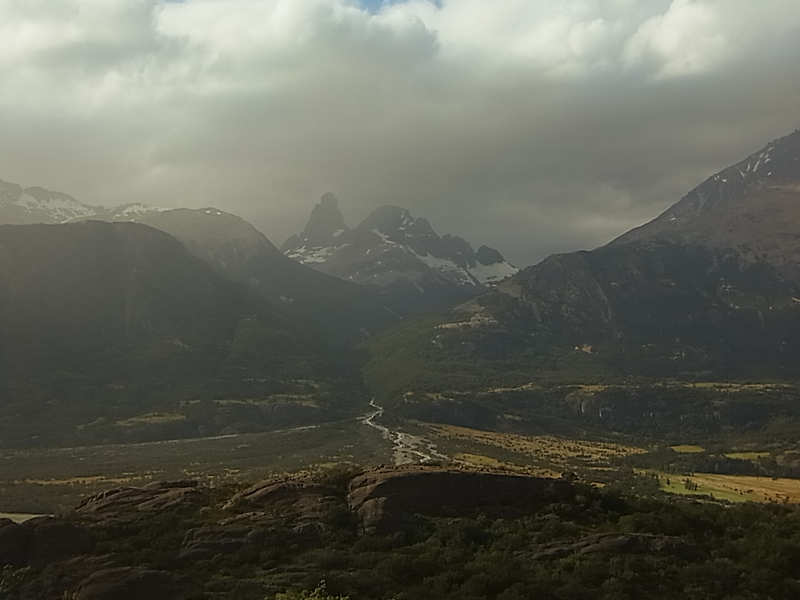 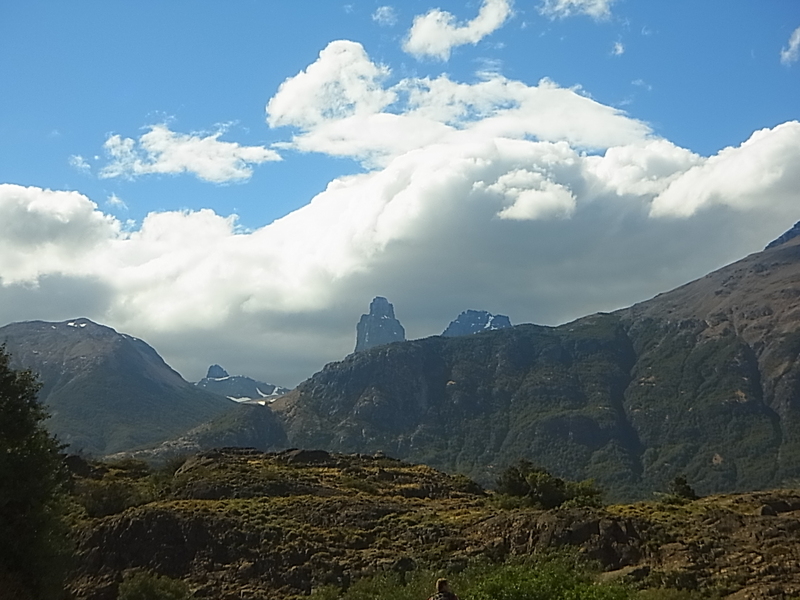 For these long years of being separated from central Chile, Patagonia still forms a more homogenous unit within itself in cultural habits and lifestyles then with the rest of Chile, which is rather different. 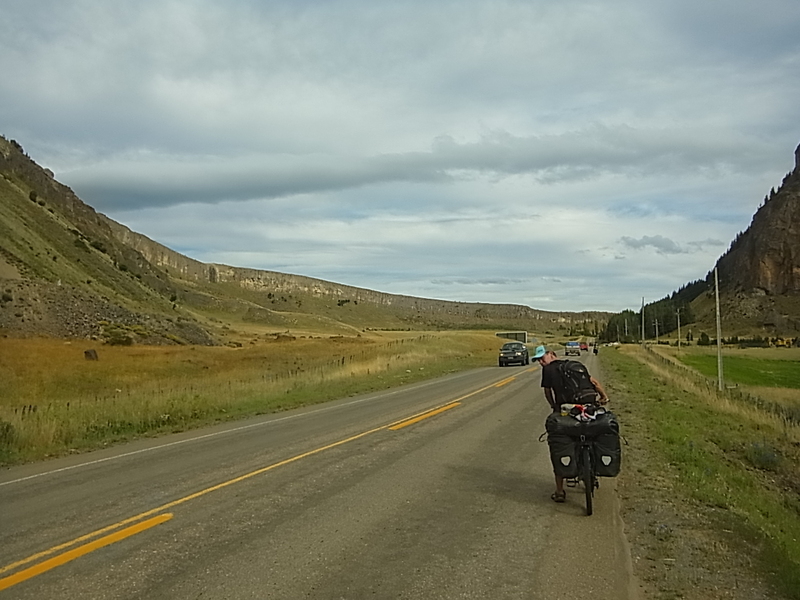 In La Junta, a sleepy small town, we spend most of the day on the town plaza, chatting with – a lot of – other cyclists passing by, most of them coming from the South and for us a welcome source of information: about the distances between villages (large), the road condition (hilly), possibilities to camp (plenty), places to visit (a lot) and, and, and…Than we travel on a bit further, direction Puyuhuapi, which we reach the next day at noon, again acccompanied by rain. 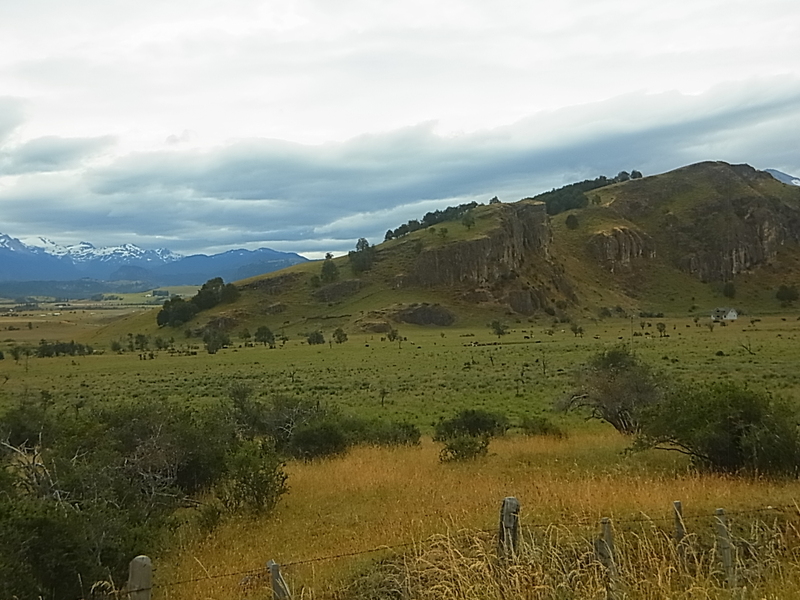 Although we are pretty wet and cold we have to admire the surrounding. 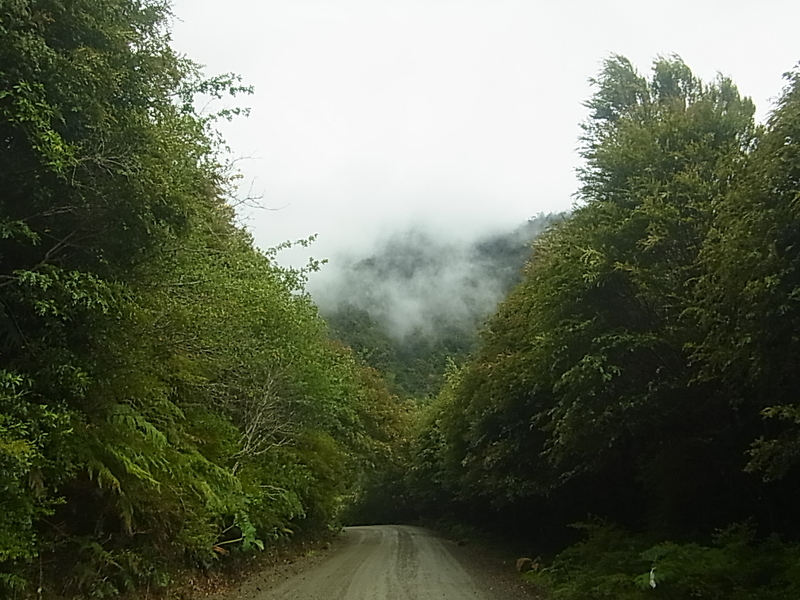 Junglelike, dense vegetation to both sides of the way, deep green lakes (fed by uncountable small streams coming down from the mountains), the road snaking its way along hills and everything covered by a layer of mist and clouds which gives a special touch to it all. 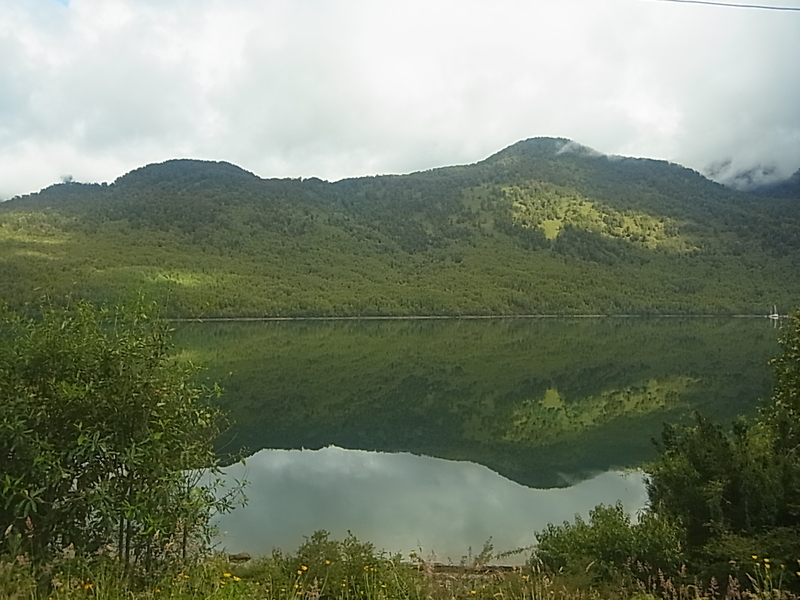 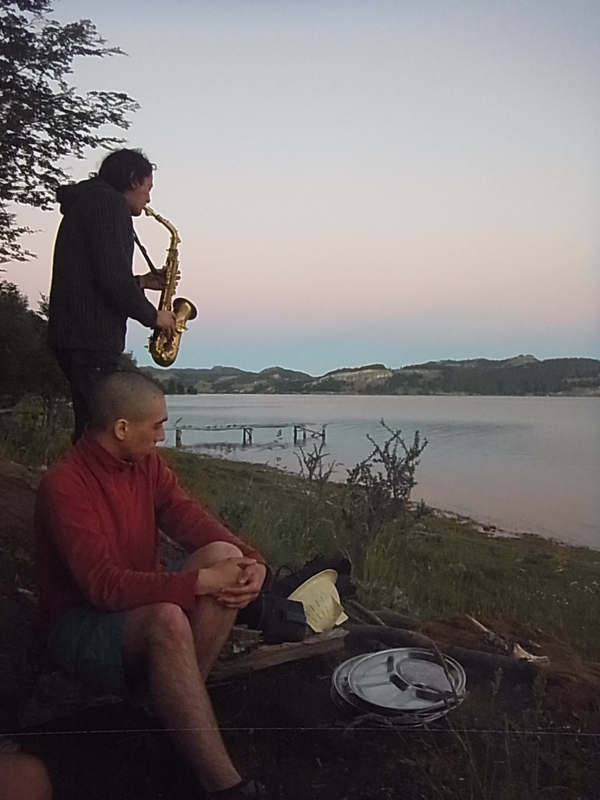 Nonetheless we are glad to arrive in Puyuhuapi and find a campsite with ´sitios techados´ (camping spots with a roof over it) and two community rooms with wood stoves where we can sit in the warmth and cook. 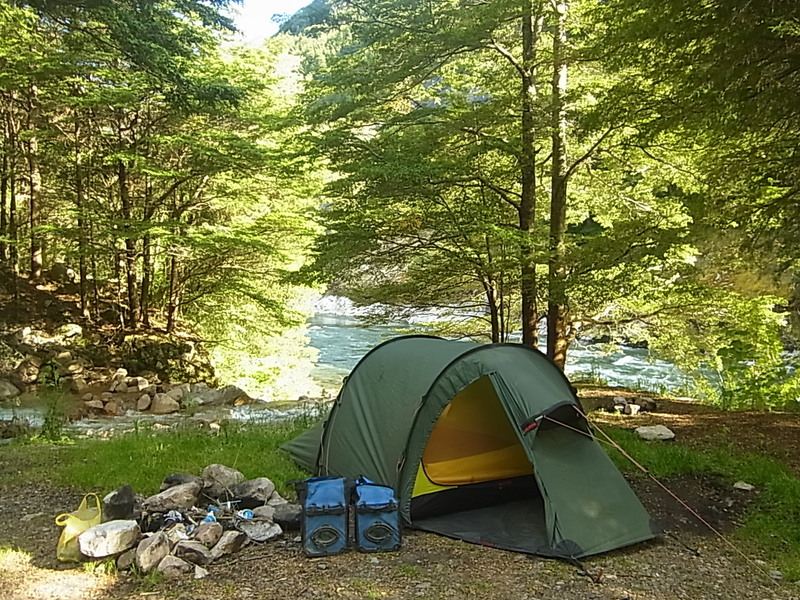 One day of rain, followed by one sunny day, then rain again – this becomes the rythm for the whole week. 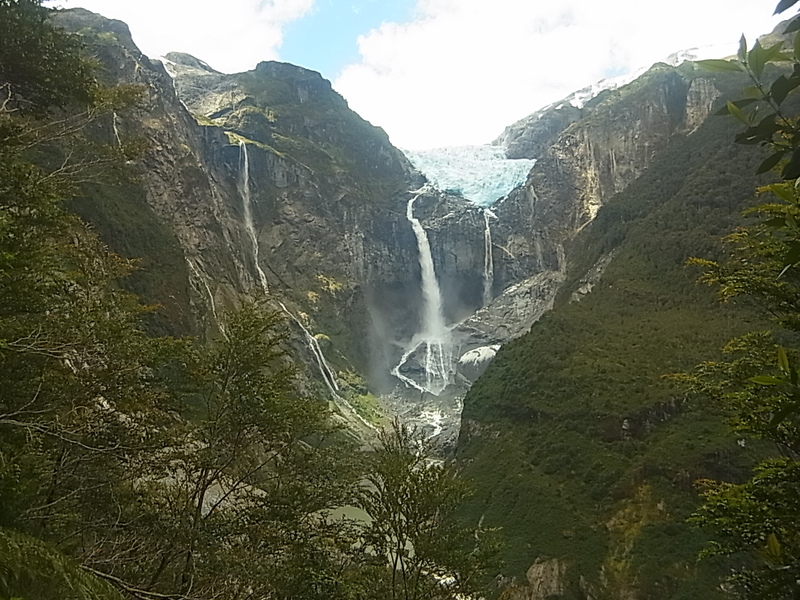 We pass by the Parque Nacional Queulat on a sunny day, go for a day-hike and get a first glimpse of a glacier, far away but still impressive. 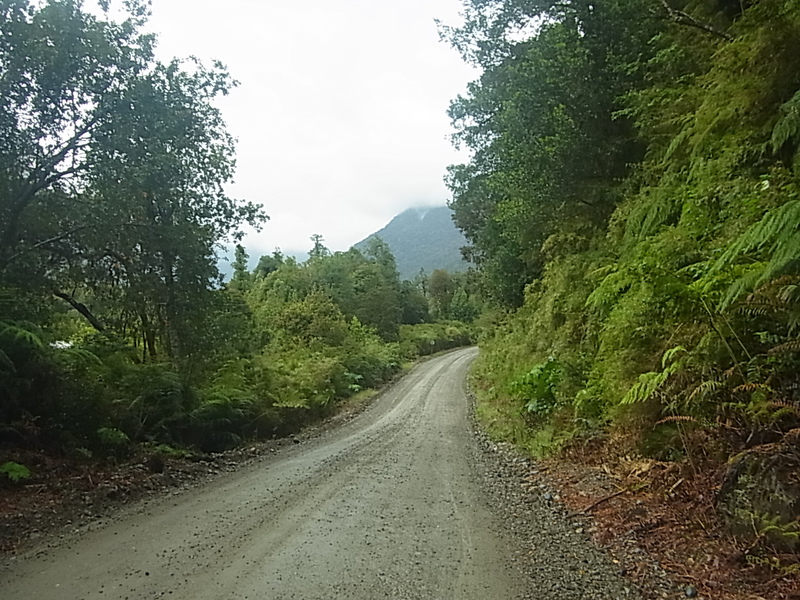 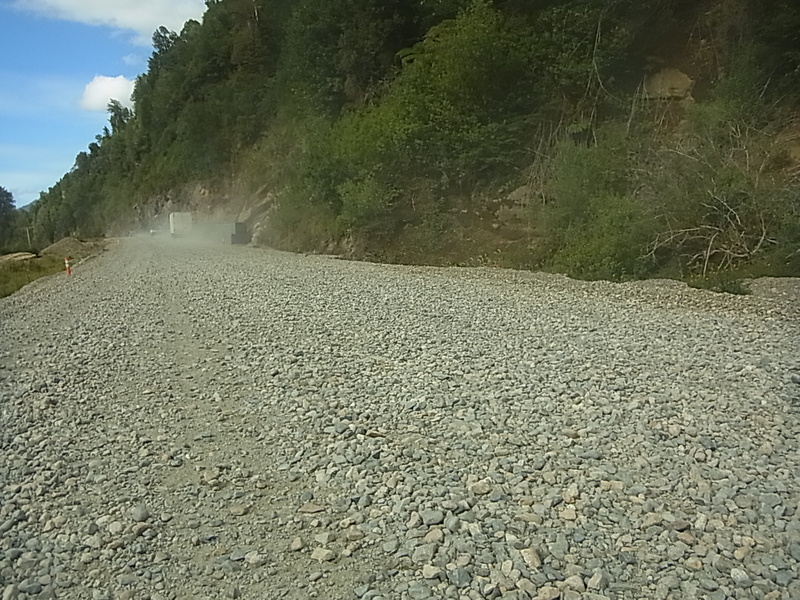 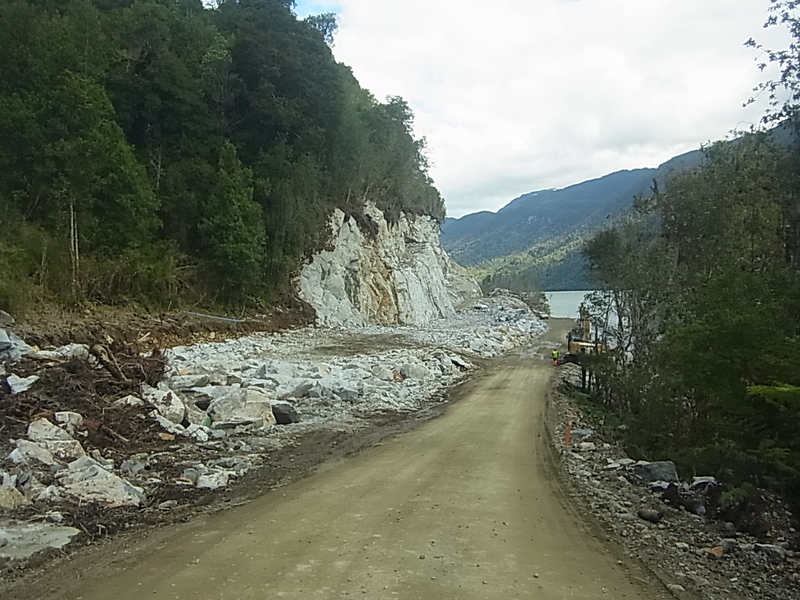 Then we have to pass a long stretch of roadworks and this makes us thinking about the need of paved roads. 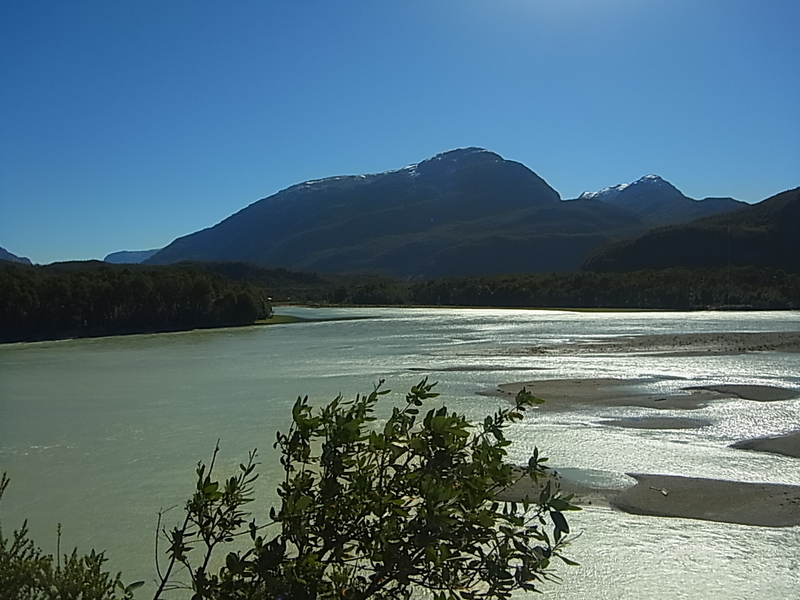 It´s such a big intrusion in nature, a destruction of eco-systems which need years to recover. 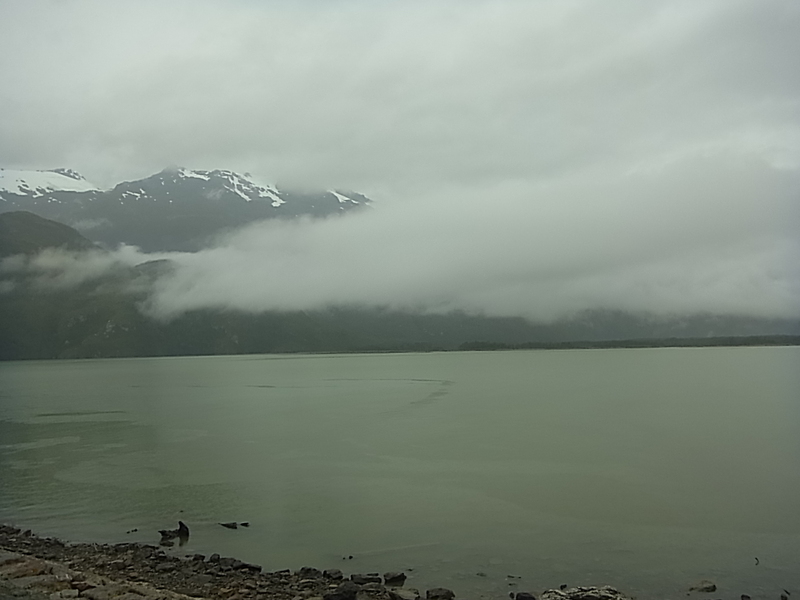 Tons of rocks have to be removed with explosives, water streams to the lakes are disconnected or diverted, trees and plants are destroyed – cycling through these spaces is sad and on top it rains again and this time the rain just adds a touch of tristesse to everything. 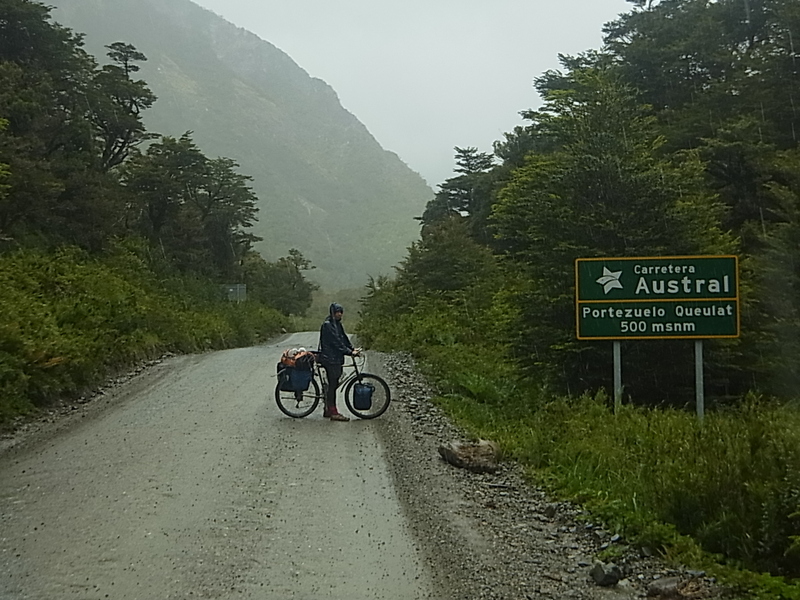 The day seems to be one of the worst we had upto now: it rains massively, wet and cold we have to cross a 500m high pass, the roadwork parts are a nightmare to cycle, all muddy or consisting of slicky small stones and no warm campplace for the evening in sight. 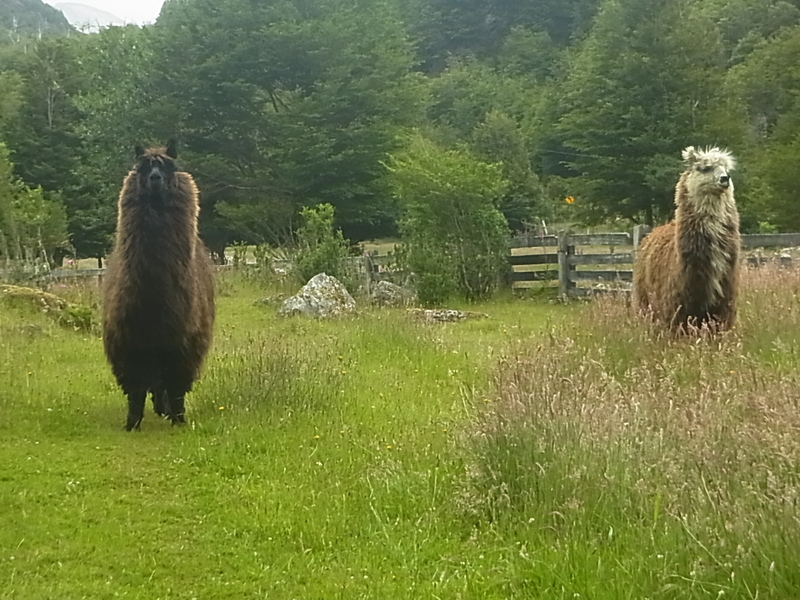 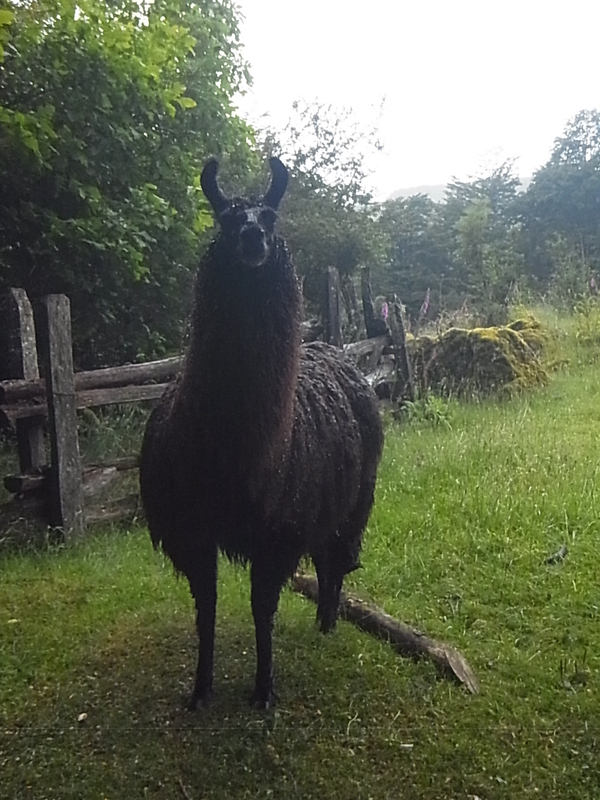 And we are not alone, there are six Lamas running around and watching us curiously from time to time, a strange place to meet these guys again. 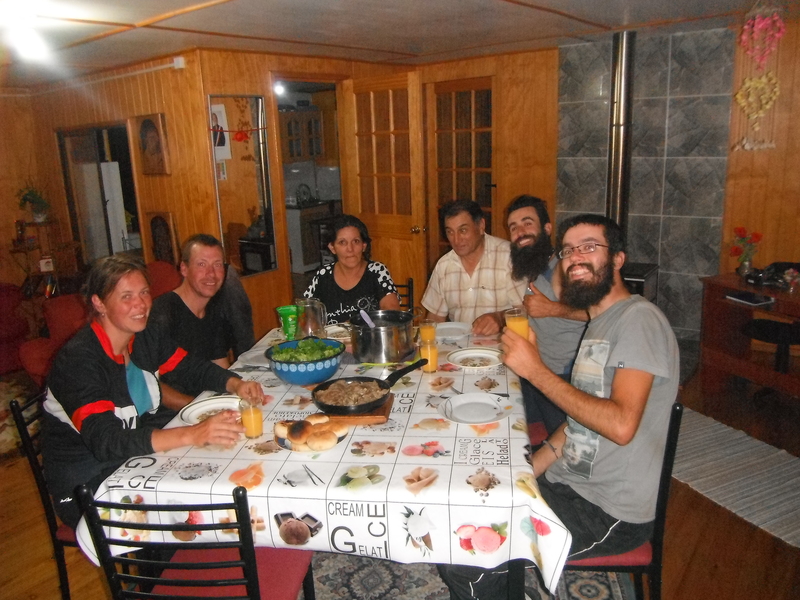 We stay put for two days until the weather gets better, occupying ourselves with chopping wood for the fire and small chats with our hosts, then it´s onto the road again and luckily with sun until we reach Coyhaique three days later. 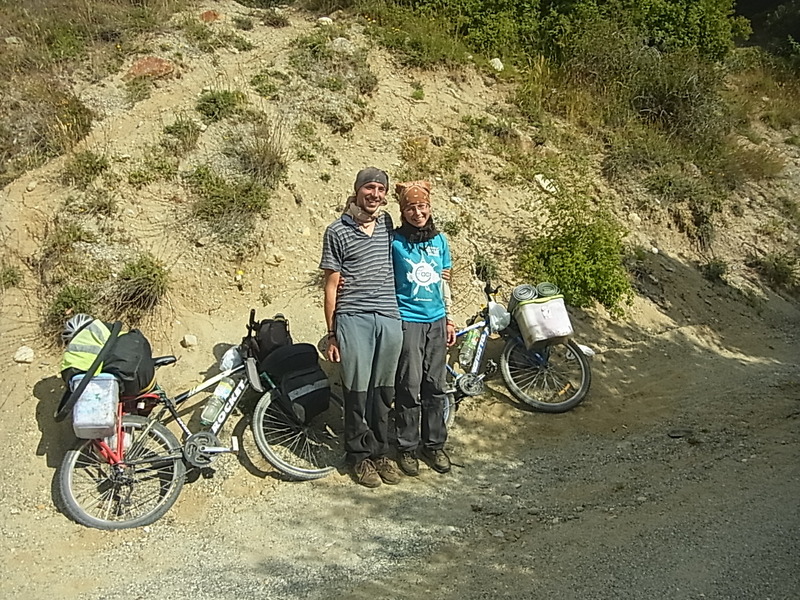 Though we take it slowly through a marvellous surrounding, for once with a nice tailwind pushing us forward and our new cycling rhythm – 10km or one hour riding and than a break- pays off, we manage a great distance and when halting in the evenings we are not as tired as usual. 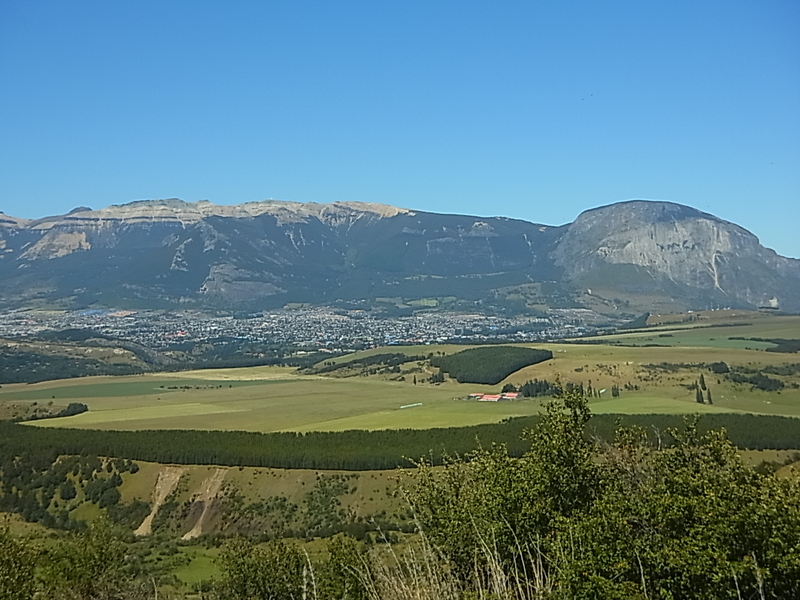 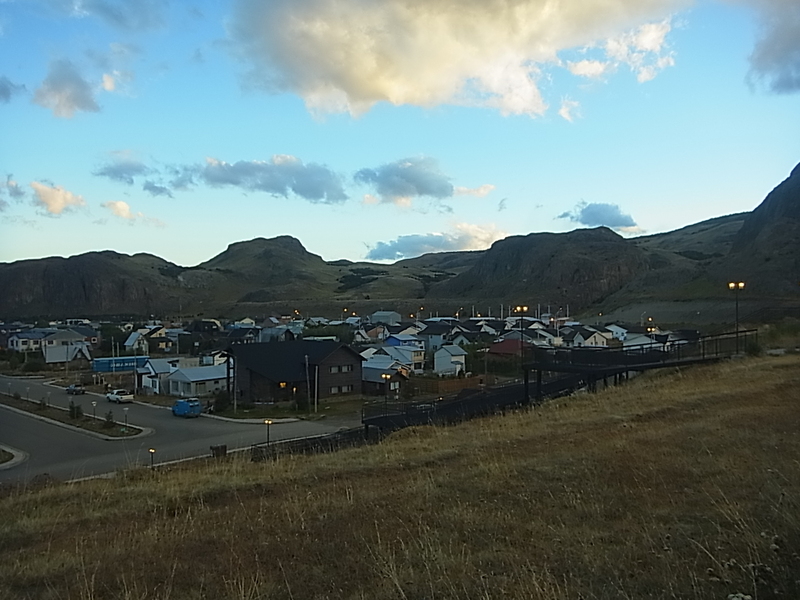 In Coyhaique than, summer is waiting for us. 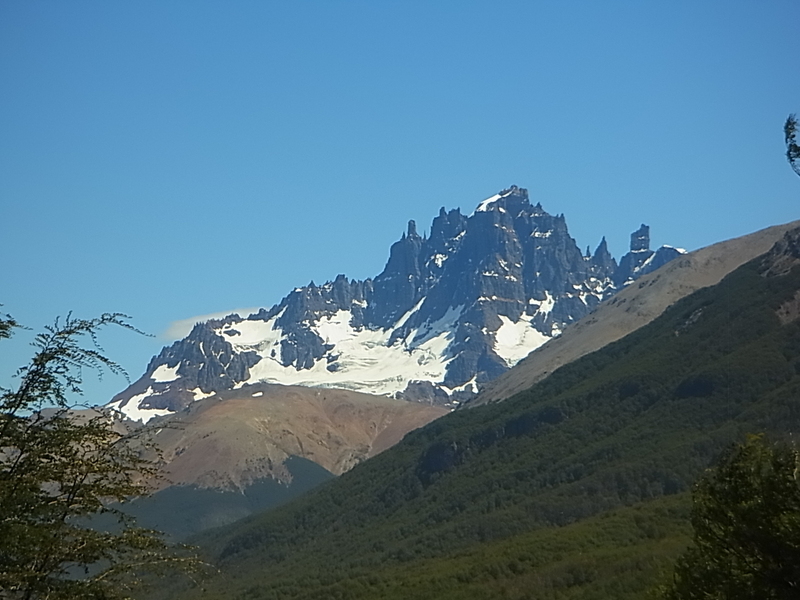 We arrive under a clear blue sky, bright sunshine and temperatures somewhere close to 30°C. 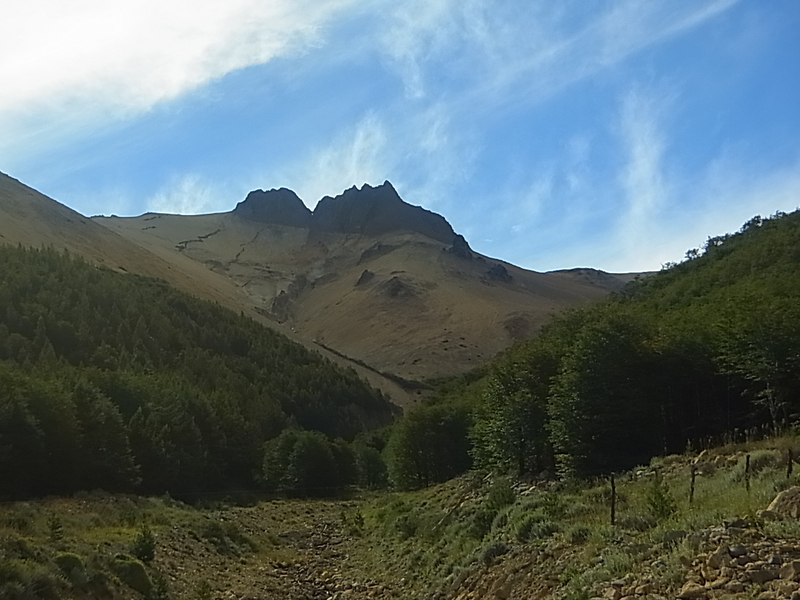 Obviously we´ve passed a natural climate barrier and are now in an area which is in general more dry and hot then the parts before. 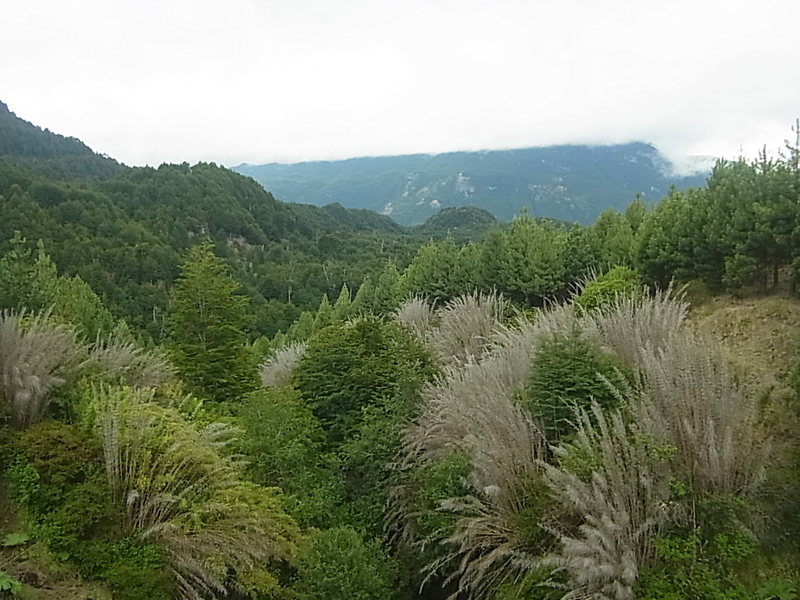 According to the climate the green jungle-density changed into wide open spaces with yellow-green meadows, groups of trees and brown-grey mountains which surround the city. 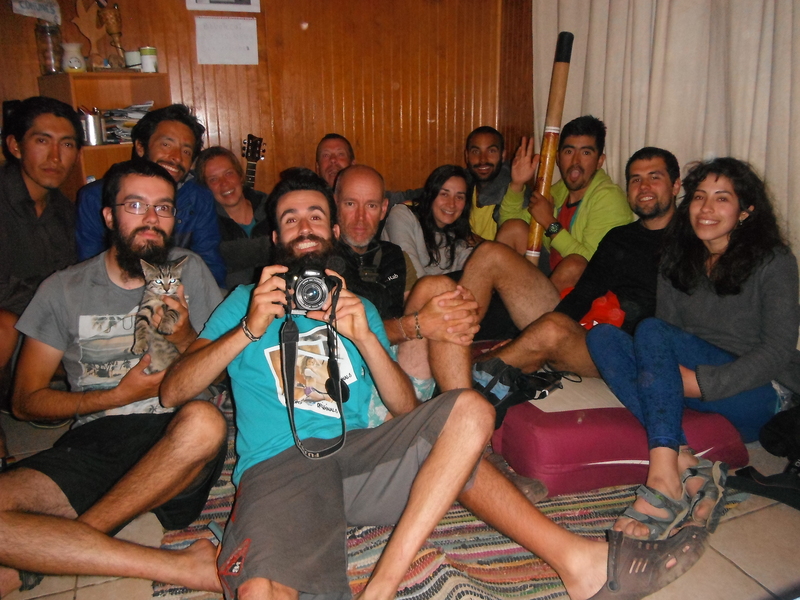 At the time of our arrival there´s only Aingeru in the house, a spanish cyclist, but over the following days many more arrive until we share the space finally with 14 people and although it´s sometimes crowded (especially when it gets to the bathroom use) itˋs a really nice crowd and we get along very well together. 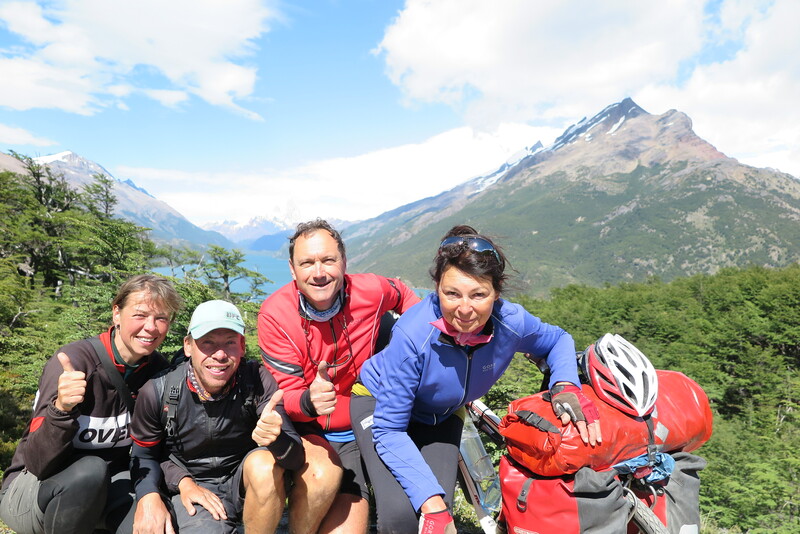 Paulina, the “head” of everything since Boris, the owner, is on a cycling tour, is an amazing host. 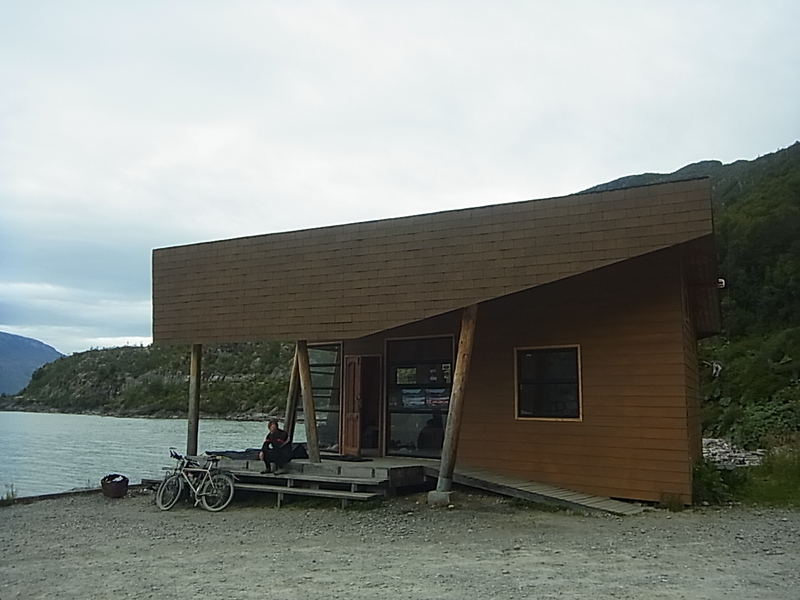 Ever friendly and welcoming to everyone she makes the house to an open space with a great atmosphere for cyclists and friends. 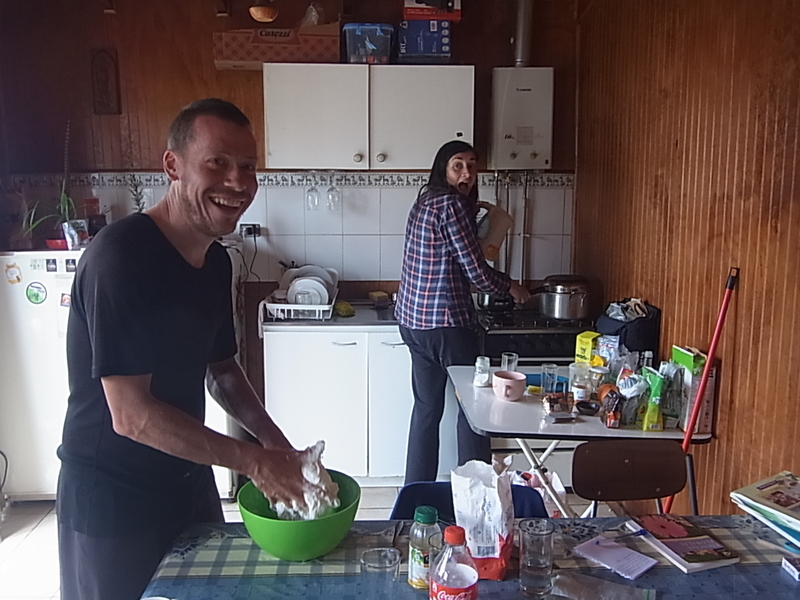 There is always someone to share meals with, evenings end very often with jam-sessions and Bram bakes the first bread of his life. 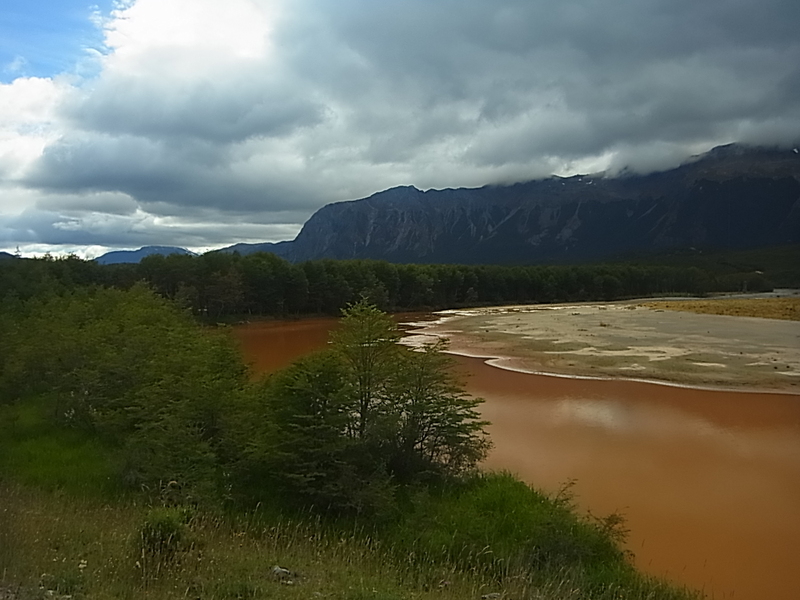 The highlight is a day-trip to the nearby Lago Pollux. 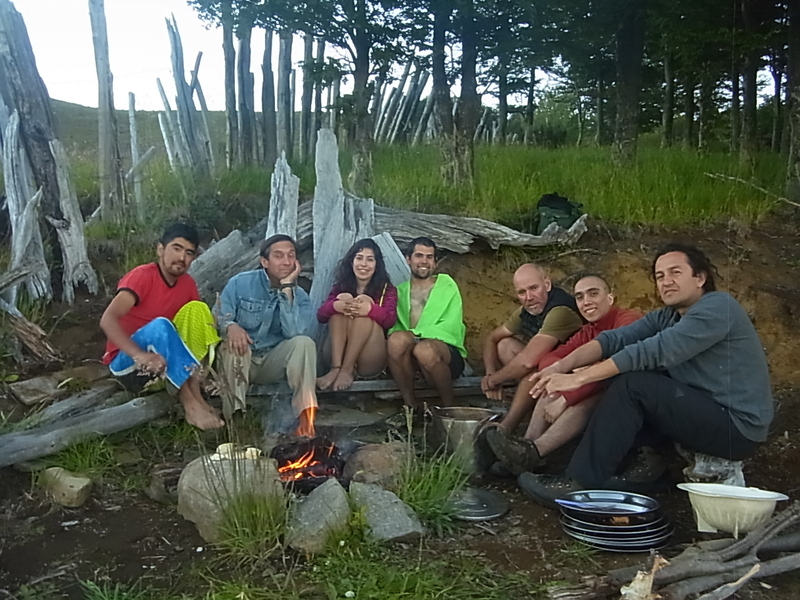 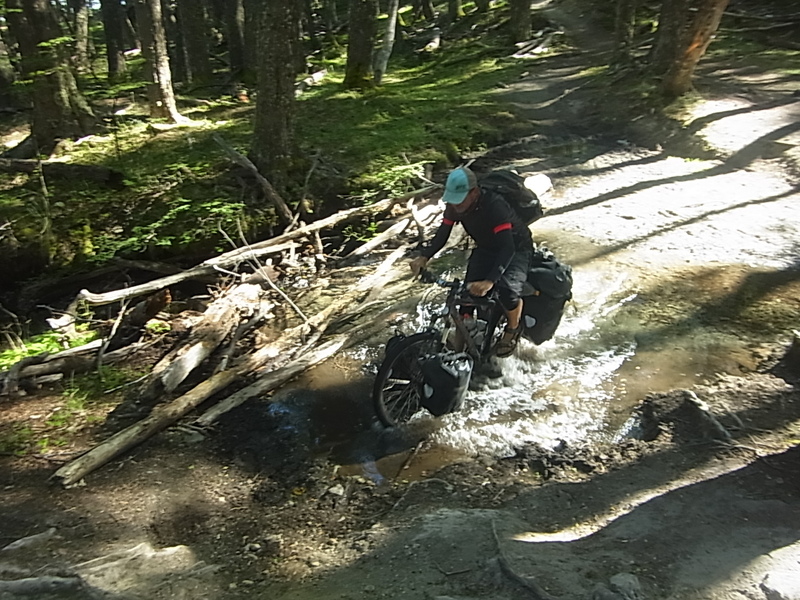 We go there with a group of eight and have a fantastic time: lying in the sun, taking a bath in the ice-cold lake or pedal around with the self-made styropor kayak, cooking and eating together, relaxing and enjoying the silence and nature around. 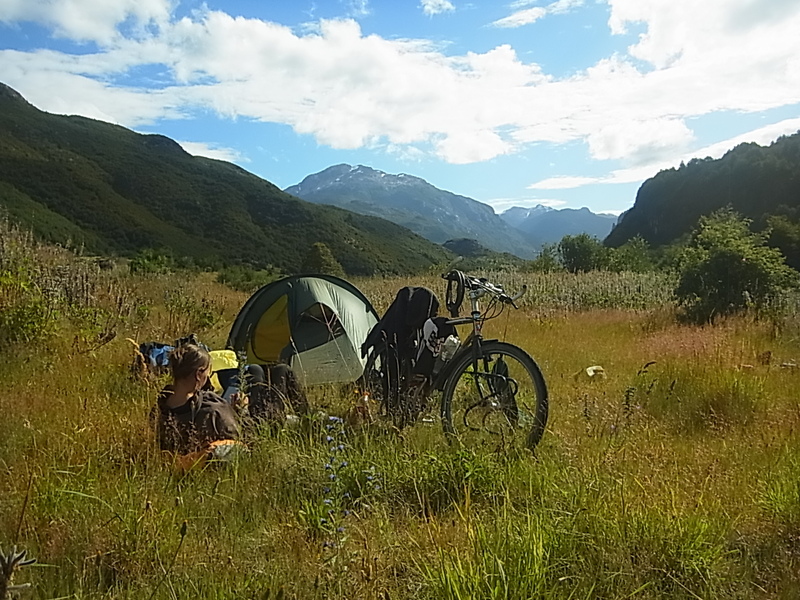 Instead of the planned three days we stay in Coihaique for eight days and wasn´t it for the limited time-period we have in total for cycling the Carretera and then get to the end of the world, we could have easily stayed for the whole summer.The only good thing about leaving the Casa de Ciclistas is, that we ´re not leaving alone. 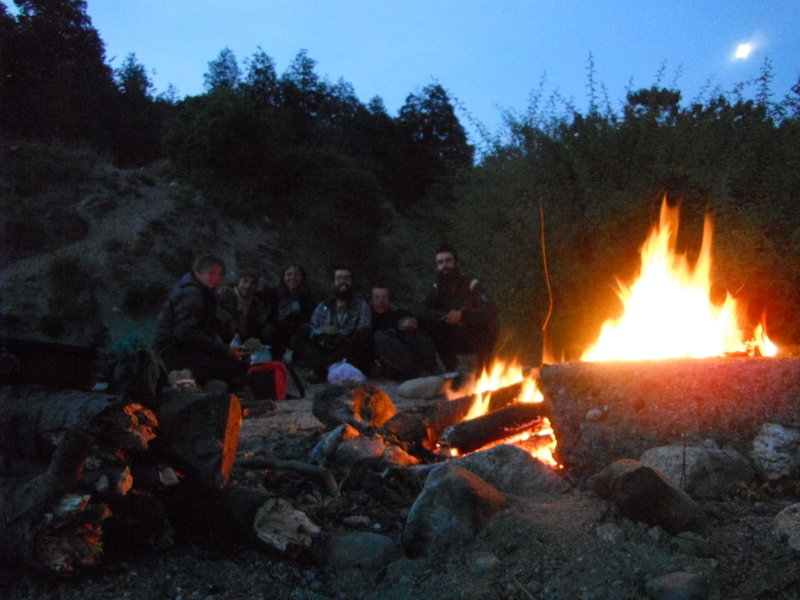 Wij blijven jullie volgen; het is de moeite waard. 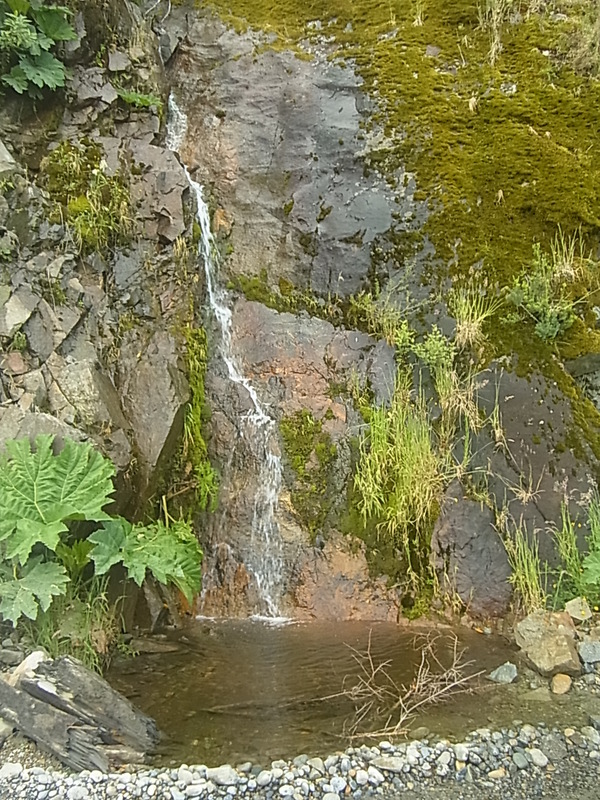 Doe zo voort en geniet maar van de natuur en ook van elkaar. 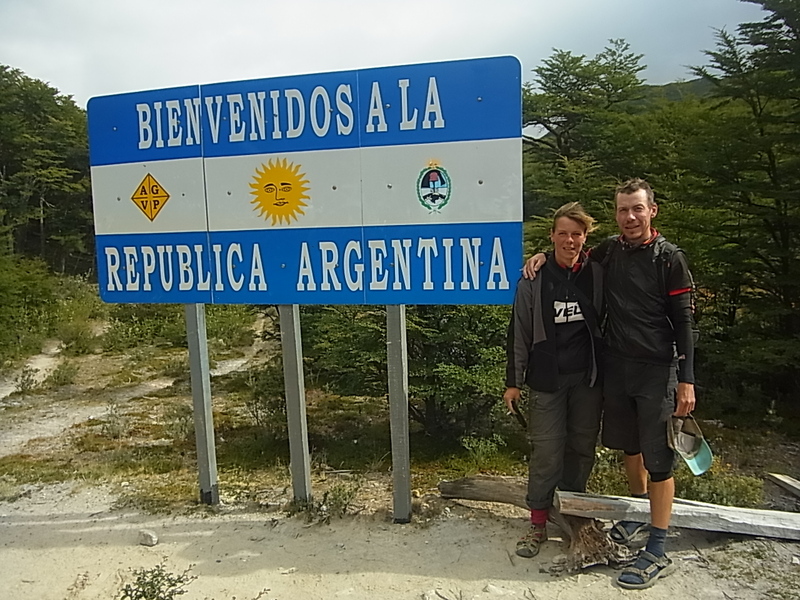 Vele groetjes, ook aan de 2 medereizigers, van Annie en Willem. 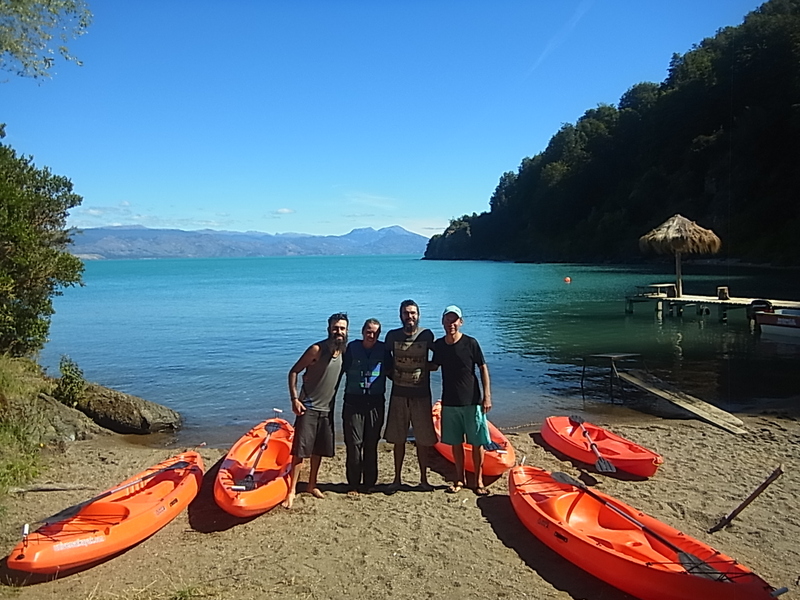 it was nice meeting you as well, and glad to hear that you arrived safe and sound in Tolhuin. 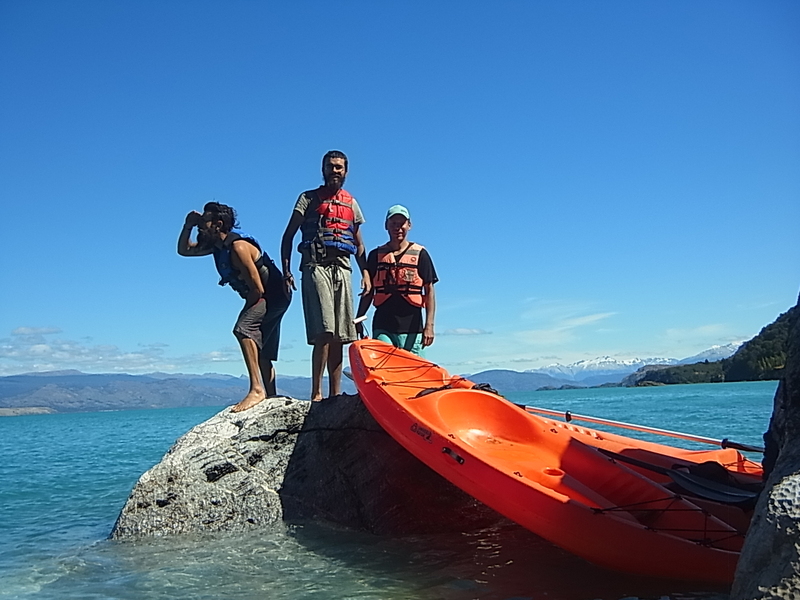 We will be checking out your blog soon, so we can find some inspiration for the pursuit of our trip.